Our cruising guide, Waggoner sister publication Cruising the Secret Coast, is available at local bookstores and online. Click book image for details. 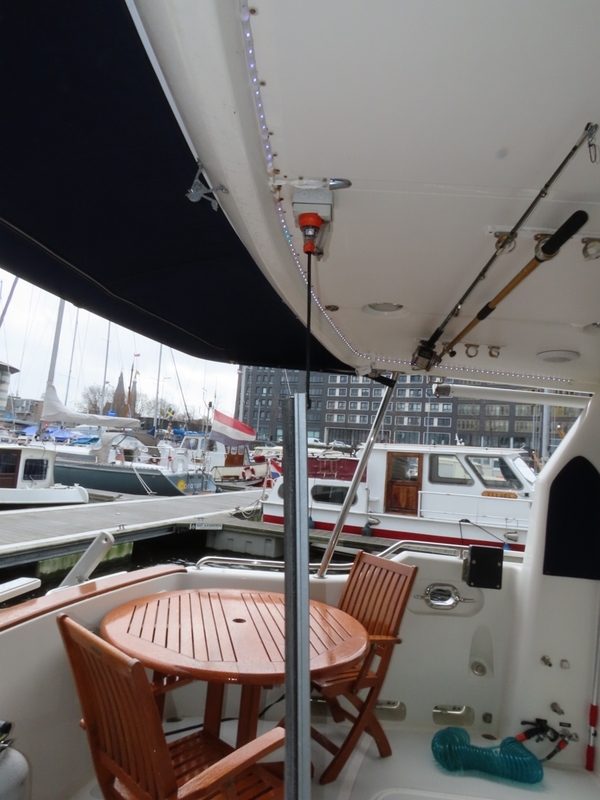 Besides being a great place to call home, City Marina IJDok in Amsterdam also was convenient to complete a number of boat projects including replacing the Jabsco 34600-0010 bilge pump with Whale Gulper 320 High Capacity bilge pump, installing a new steering pump, and adding shorepower soft start. Some of the gear and supplies we brought back on our two return trips to the US, and in the pallet we had shipped from Seattle in July. But we also took advantage of convenient local sources and Amazon in the UK and Germany to obtain other products. 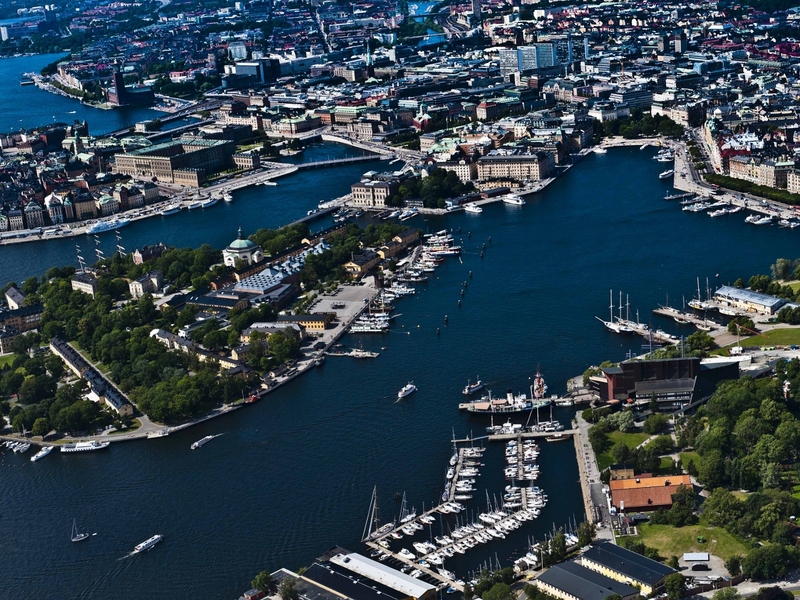 And of course, we did a lot of purchasing, stowing and planning to get ready for our summer trip to the Baltic Sea. 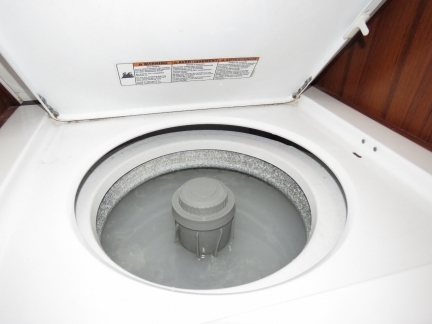 We had a moment of concern when the washer went into a fault mode where it just dumped water down the drain rather than fill—both the drain and the fill were open at the same time. 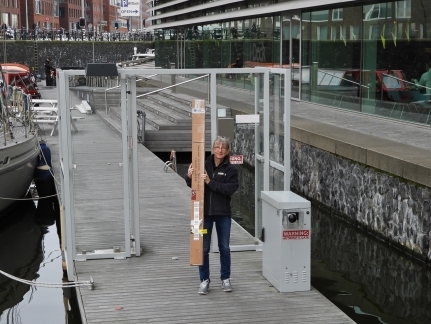 We thought of all kinds of mitigations, including using the marina laundry facilities, picking up a replacement part in Seattle since we’d be there soon, or even having a new one shipped sea freight to Amsterdam as we’d be there long enough. 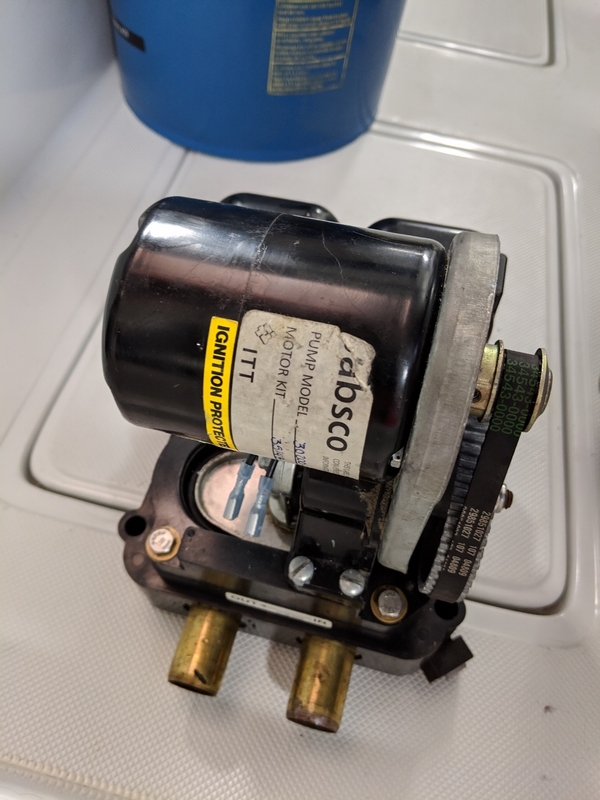 But it appeared to be a control systems bug where if you restart a cycle at just the right moment, or rapidly rotate the mechanical control, the drain valve close isn’t triggered and it stays open. 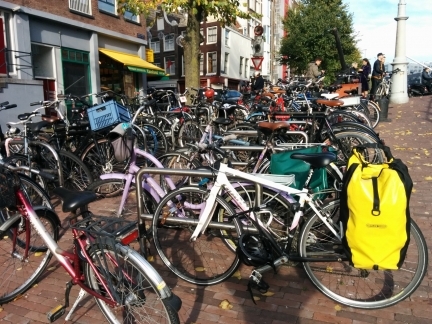 After restarting the cycle it appears to be operating correctly now and we suspect it will continue to operate fine. 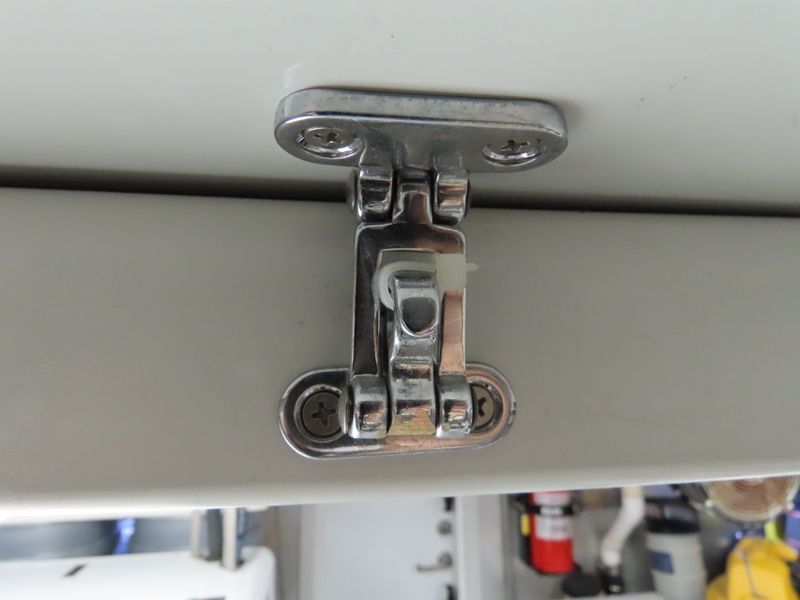 Essentially, it’s a design bug rather than a worn mechanical control system part. Our power washer, that we find super-useful for cleaning the boat, stopped working. James found a faulty RCD and it’s now back operational. 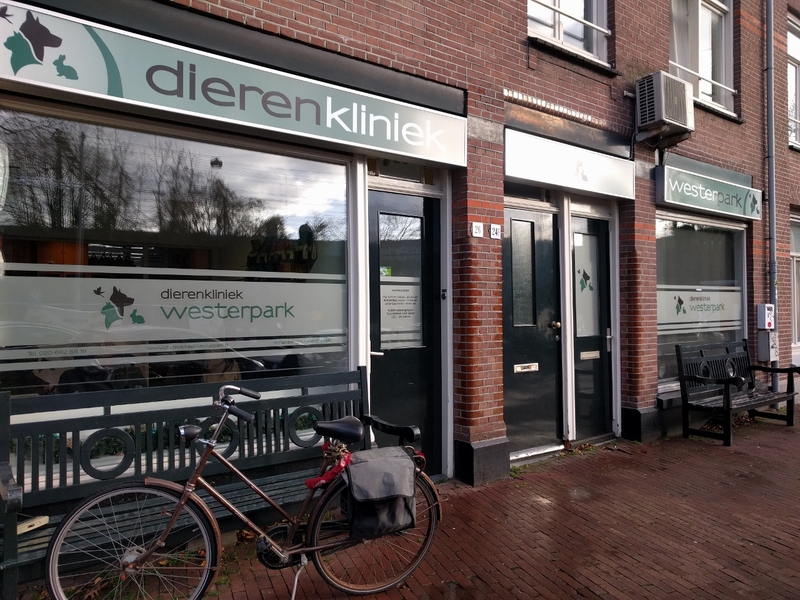 At De Kledingspecialist to drop off a dress for alteration. 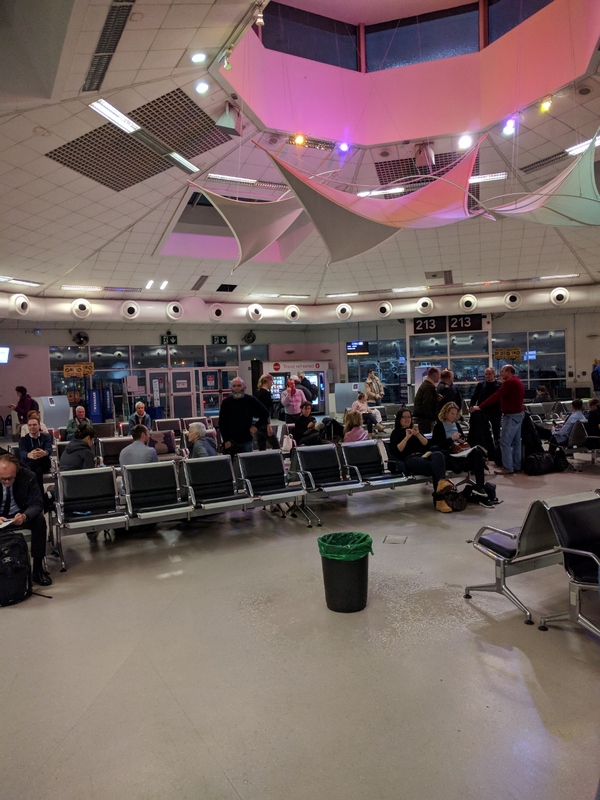 James made a two-day work trip to Dublin and a major storm delayed his return flight. 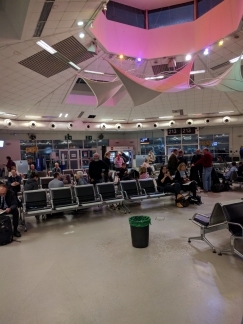 Rain fell so hard at Dublin airport that it was pouring inside some parts of the terminal. Spitfire can be a picky eater, so we left London with enough cat food to get us to Amsterdam to avoid the hassle of having to test and purchase food for him in Norway. 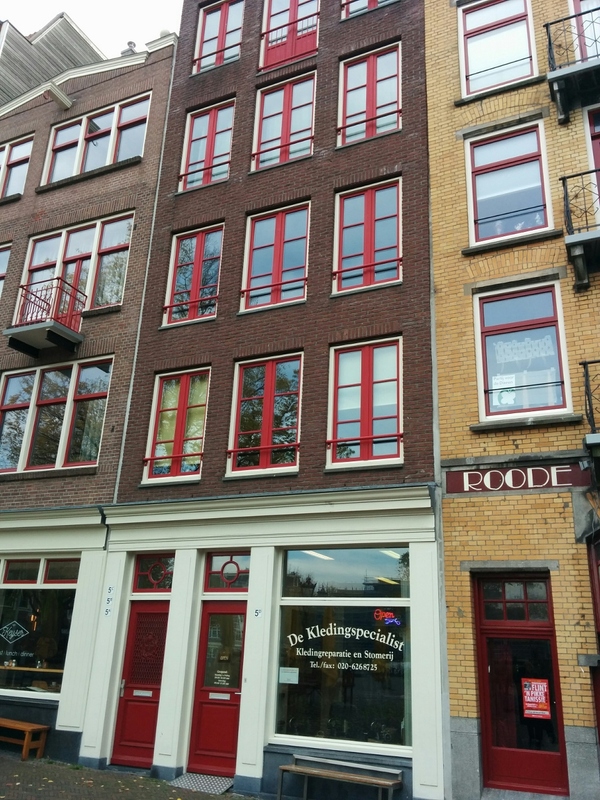 Now that we’re in Amsterdam, we have more time to try out various foods to see what he likes. 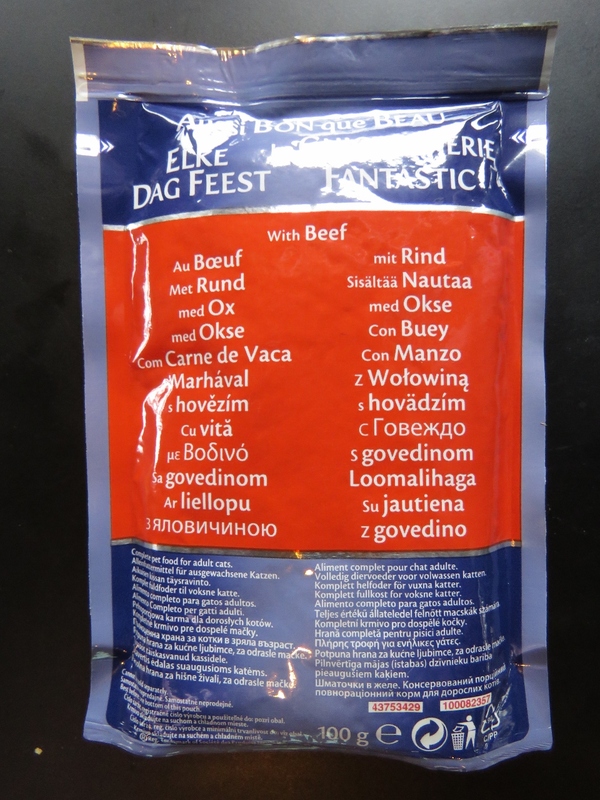 This one is translated into an impressive twenty-five languages. The gray water tank sensor was clogged with hair, causing rapid cycling at the control panel the past few days. 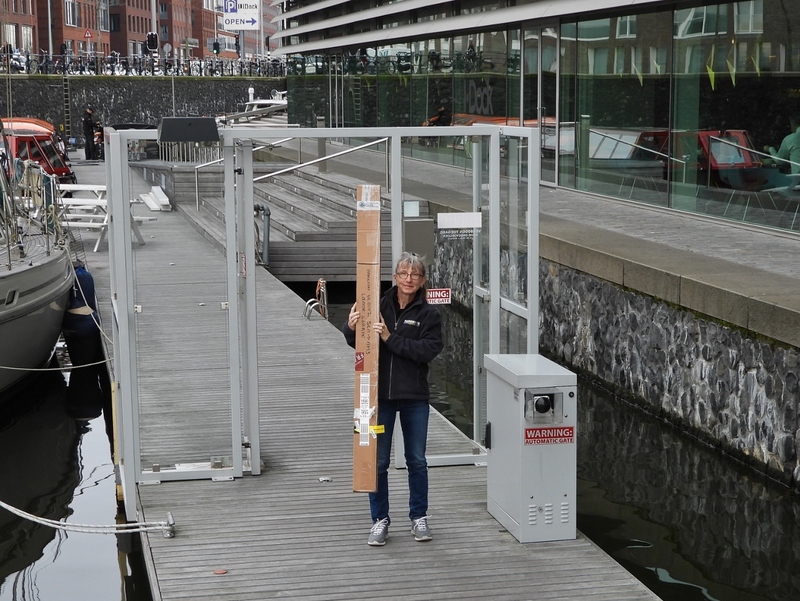 Our four big suitcases made it to Amsterdam yesterday morning, but our cardboard box with the antennas didn’t. We weren’t particularly hopeful of ever seeing it again, but we received the package this morning in good condition. 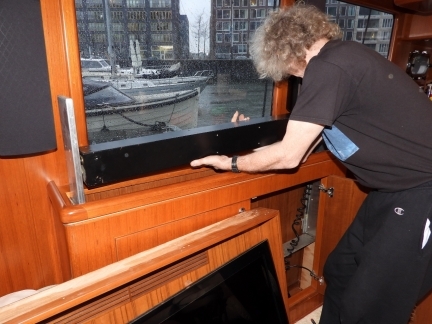 When we’re moored for a while where the weather is cold, we cover the engine room air intakes with custom canvas covers to keep the boat a little warmer. James noticed a tiny whiff of diesel smell in the engine room and found a couple of drips on top of the wing/gen start batteries underneath the wing engine fuel tank. 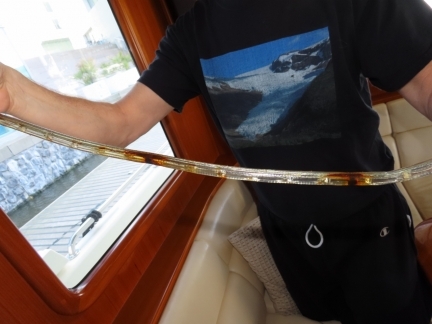 It was easy to fix: the lower sight-guage O-Ring on the wing engine fuel tank had failed. Spitfire developed an upper respiratory infection and has been coughing a lot since we returned to Amsterdam. Dierenkliniek Westerpark saw him within a couple of hours of our calling and Dr. Elleke Frumau recognized the problem immediately and quickly had him doing much better. Ten days later he seemed fully recovered and back to his normal energetic self. Small illnesses start to get very dangerous quickly when a cat is as old as Spitfire is at 15 years. A grocery delivery from Albert Heijn. Paying for the order was a bit of a challenge—they only accept local Maestro debit cards on delivery. None of our debit cards or credit cards would work and they don’t take cash. Eventually their customer-service person suggested the delivery person pay with his personal card and we pay him back in cash as a way to resolve it. Impressive commitment to customer service—we didn’t think we were going to get that one resolved. We much prefer box wines when a decent one is available, as they are so much lighter and more space-economic. 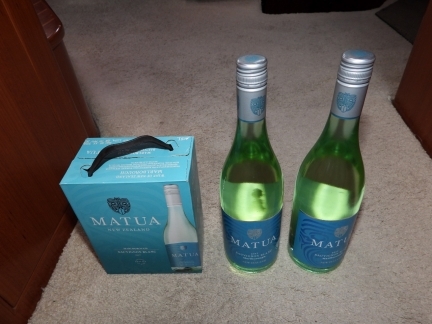 Matua, a New Zealand Marlborough Sauvignon Blanc that we quite like, is available here in 1.5L boxes that consume half the space of two standard 750 mL bottles. 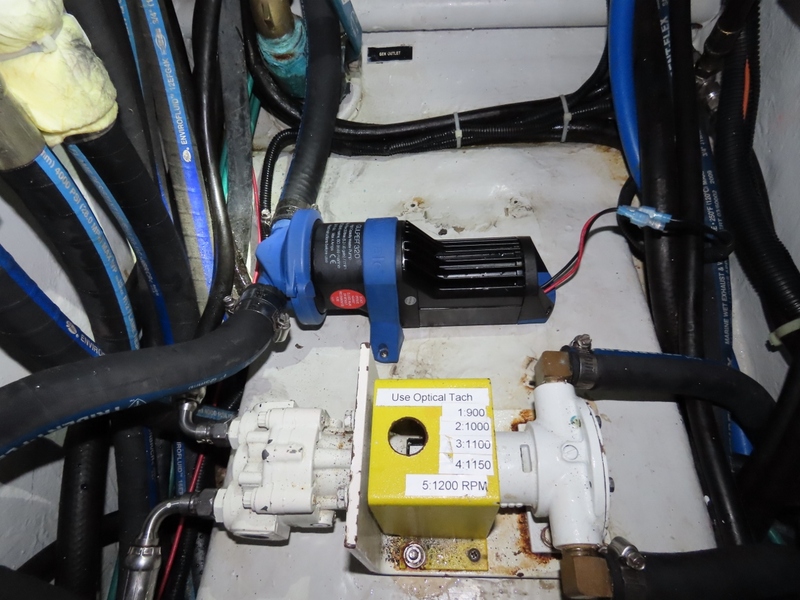 Today we started the job of installing the second Accu-Steer HPU 200-24 steering pump, that arrived in our sea freight pallet. Here, the old Accu-Steer HPU212 pump is partially removed. We’ll blog the details. At Kema Meat to pickup a turkey for Christmas dinner. 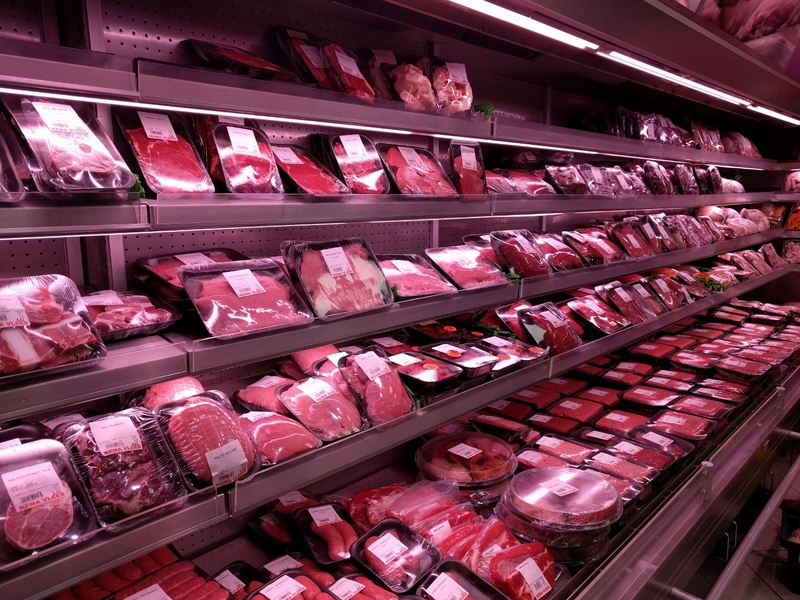 They have an excellent selection of good-quality meats. 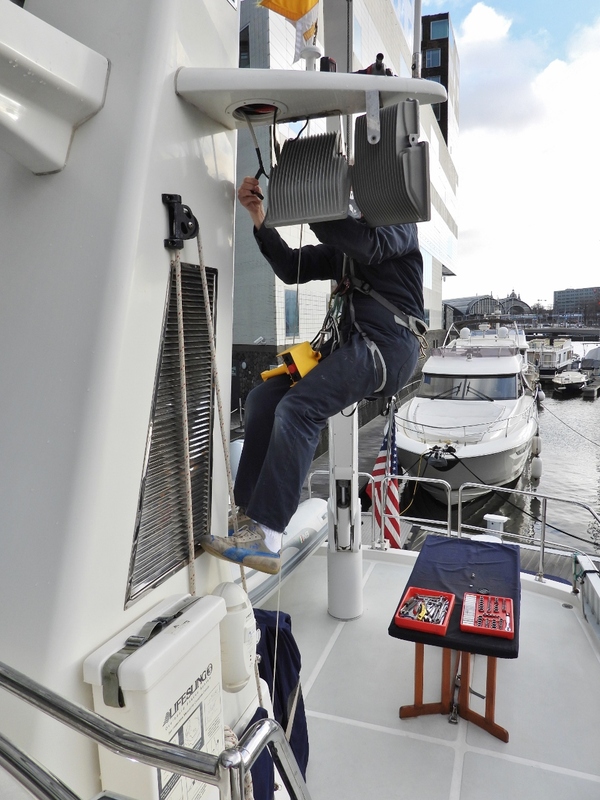 While transiting the Kiel Canal, we had issues with our davit that we eventually traced down to the pendant. At this time, we changed pendants and were back in business. 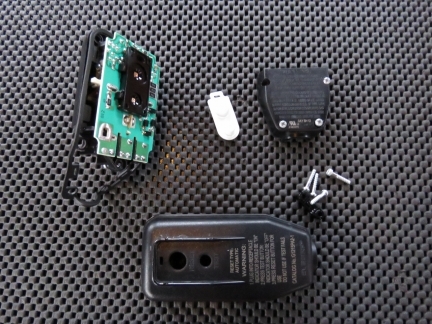 It’s a bit hard to believe, but that third never-been-used pendant that costs just under $1000, had a broken connector, probably due to aging plastic or perhaps it was broken since new. The good news is that it worked and it’s the only one of the three that still does. The connector is permanently installed on the end of the cable, so we decided to repair it by gluing it up rather than replacing it. This worked out remarkably well as you can see in the picture. 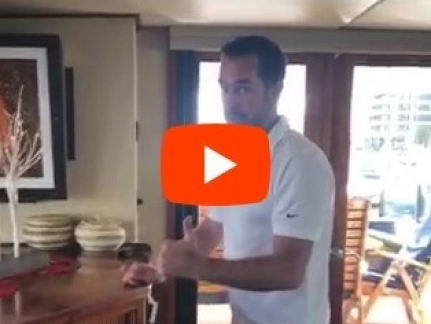 Just after we sat down to dinner at Bistrot Neuf, we received an email from Chris Allard, CEO of Metal Shark Boats and ex-owner of Nordhavn 62 Pendana. Chris had read the post describing our TV lift problems and sent us a video response titled “My Version of a TV Lift”, where he showed a highly-reliable TV lift design that’s he’s using on his boat. We both laughed so uproariously that everyone in the restaurant was looking. Update 12/25/2018: Solved problem. It’s great to be hanging out in a nation of people willing to help others with even fairly obscure challenges. Thanks to Daniel Boekel of ShipCraft Engineering and Jan Pieterse, we’ll get the brackets in early January. Thanks! To replace one of our failed side flood lights, we’re moving to a slightly higher output light and that requires a larger support bracket. The support bracket that comes with the lights (pictured) is painted steel and won’t last more than a few months in a marine environment before rusting. 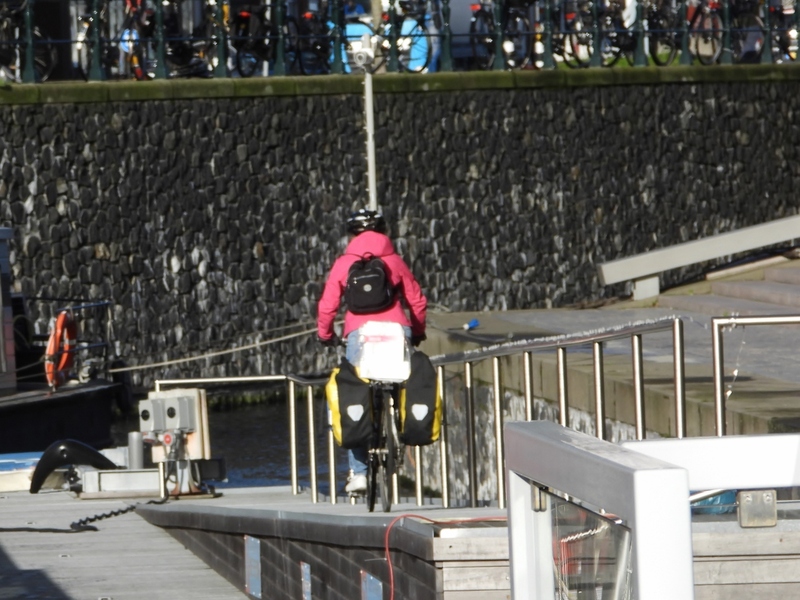 We need a stainless steel fabricator in the Amsterdam area to build a few of these brackets for us. 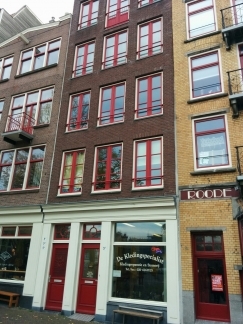 Does anyone have any experience with fabricators in the Amsterdam area? 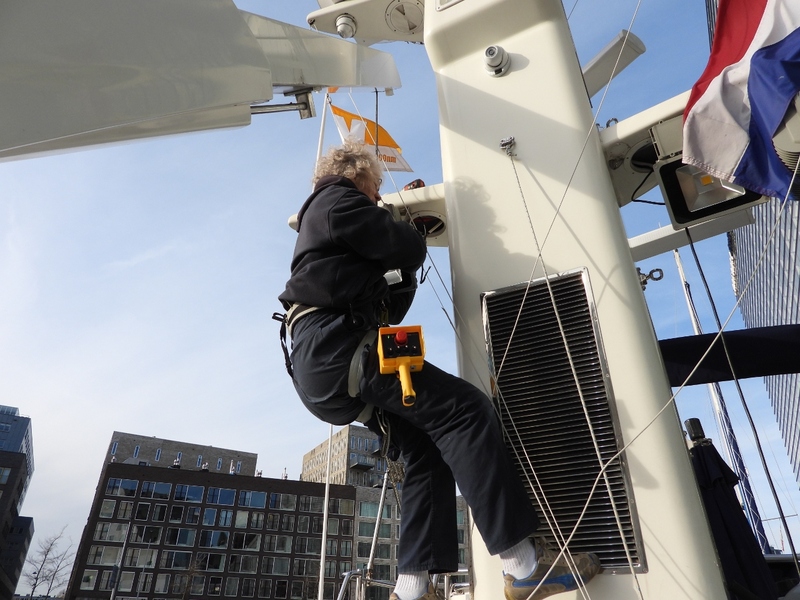 James, wearing a climbing harness, lifting himself up the stack by crane to drill a hole for a new aft-facing camera. The current bullet camera under the winglet gets bumped too easily and as a consequence its hinge will no longer secure it in place. It’s also too close to the courtesy flag. 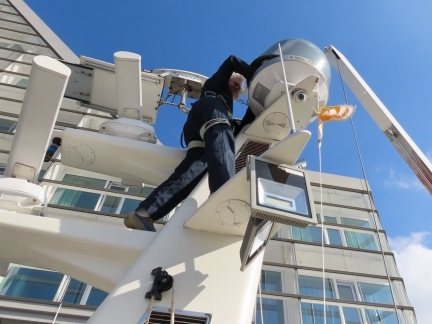 The new dome camera in place near the top of the stack as James lowers himself back down. 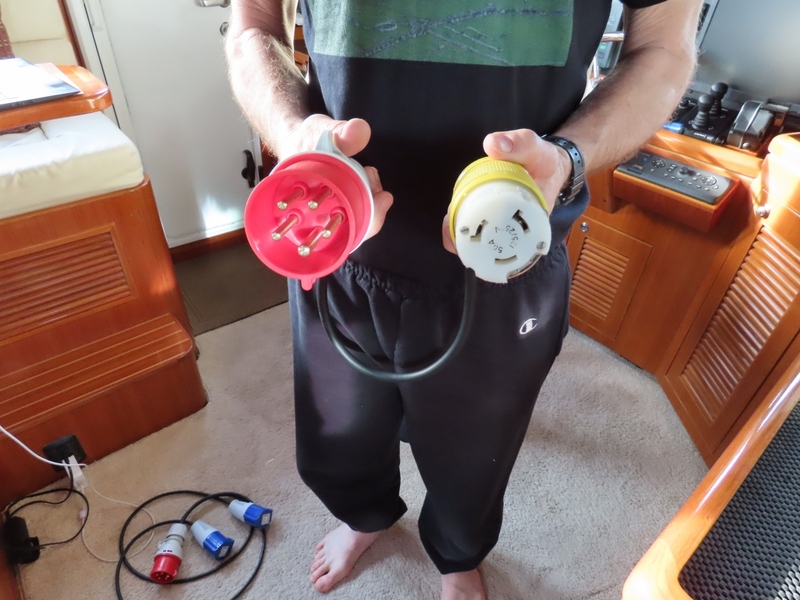 When we installed the dual power system, we didn’t have a male outlet on board, so we’re using a female outlet with an adapter (blue cord at right). Here James is building the mounting base for the new male outlet. With the new male outlet mounted (visible at the right of the picture), James is dissembling the female-female pigtail we no longer need. 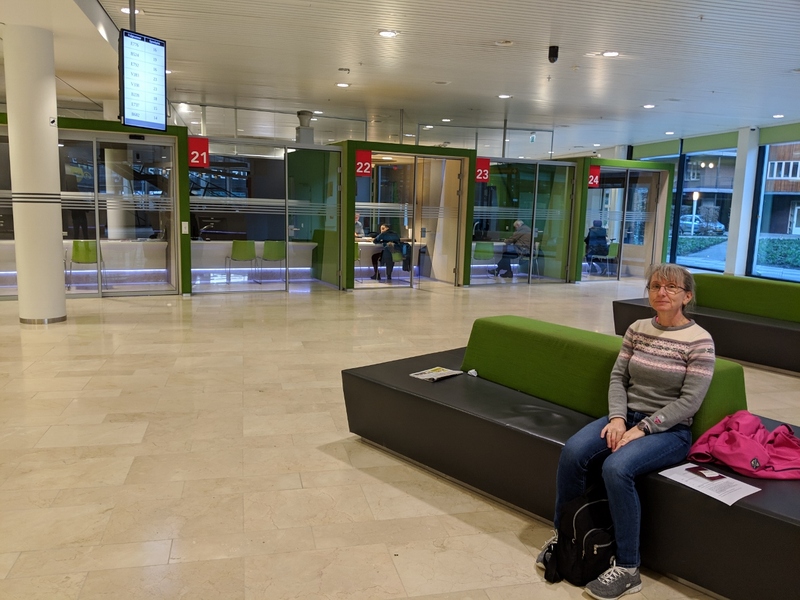 After being unable to pay for delivered groceries using a foreign card, we opened a Netherlands bank account. We just received our Maestro card, the main debit card accepted in the Netherlands. We typically open a local bank account when we are going to be in a country for a while anyway, as it also simplifies online payments to local vendors. One of the items we brought back from our trip to the US was a VHF radio for the tender. 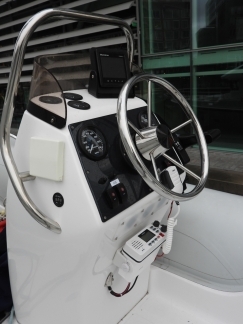 We always carry a hand-held VHF radio when out in the tender, but having a permanent one means we don’t have to remember and will always have a radio with us. 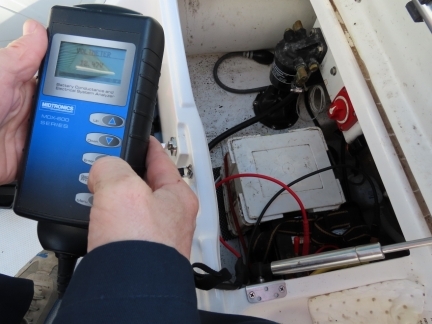 We believe an AIS is one of the most important safety devices. 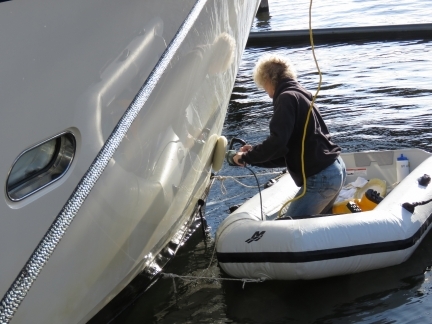 We use it constantly on Dirona and have decided to install one on our tender as well. Here James is installing a Vesper Marine XB-8000 AIS (small blue box visible in the top left of the locker). 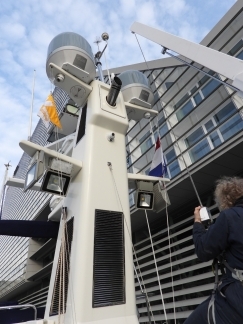 The tender now broadcasts AIS. 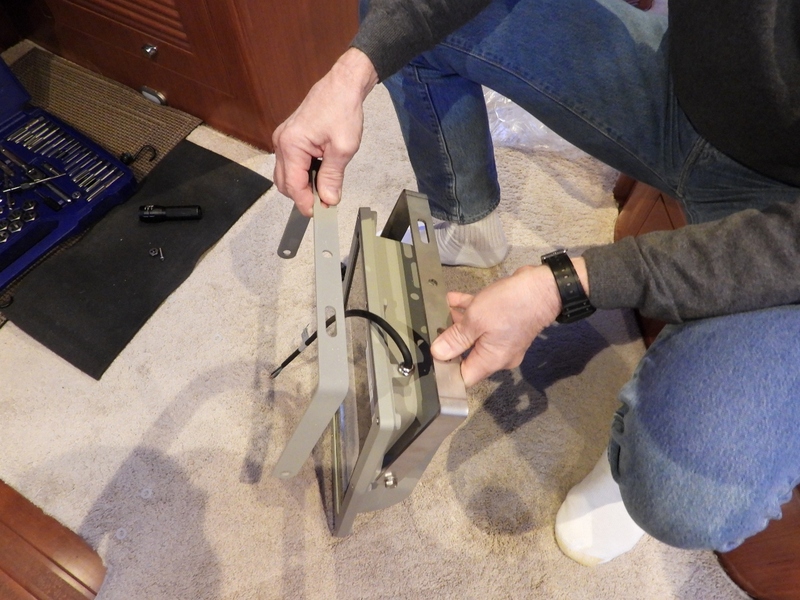 Daniel Boekel of ShipCraft Engineering was able to get us new mounting brackets for our side floodlights. 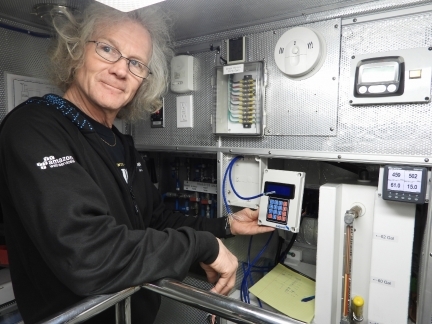 His work in lithium ion energy storage has him frequently ordering fabricated parts. Our brackets were added to his order last week and its already all done and ready to go. The new stainless steel brackets not only won’t rust, but also are much beefier than the painted steel originals so won’t rattle as much. 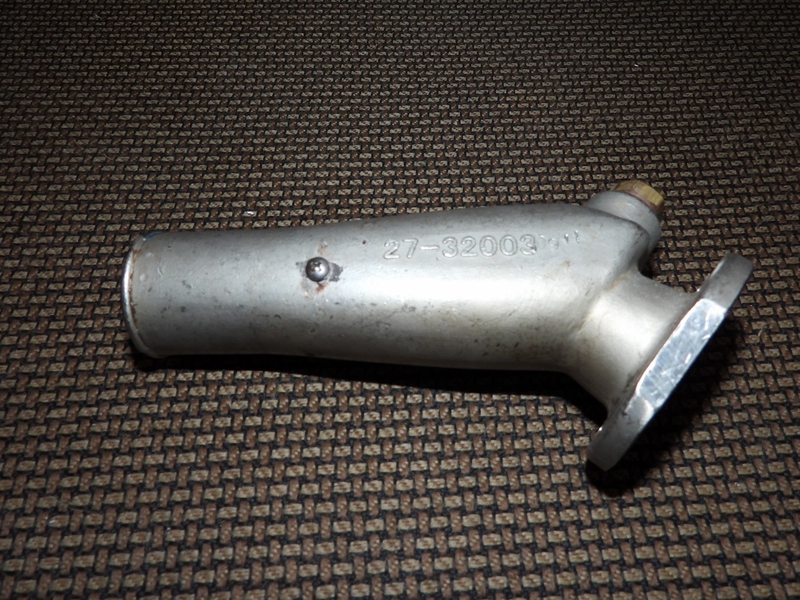 After we replaced the wing engine exhaust elbow due to a pinhole leak, blog reader Steve Coleman suggested we drill, tap and plug it. Steve says this is a technique used in the past on cast iron boilers where a a casting imperfection causes a small pinhole leak in an otherwise un-damaged part that would last for years if not decades. 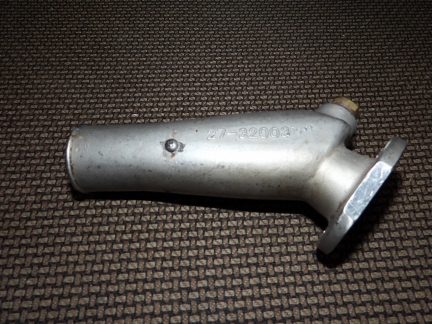 The completed exhaust elbow with a stainless steel screw plug. We rode our bikes to Specsavers to buy some new glasses—we’d each lost a pair of the two we’d both purchased in London last winter. 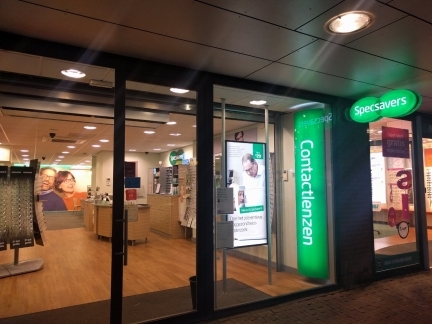 This is the third country where we’ve purchased glasses from Specsavers: Australia, England and now the Netherlands. Our KVH V7hts satellite system has been producing progressively more frequent errors over the past few months. Some of these were kind of scary: “ERROR 218: SKEW MOTOR ASSY”, “ERROR 206: AZ MOTOR ASSY”, “ERROR 100: ANTENNA POWER OPEN” and “ERROR 400: OUTSIDE COVERAGE”. It was beginning to look like we may have a hardware issue. 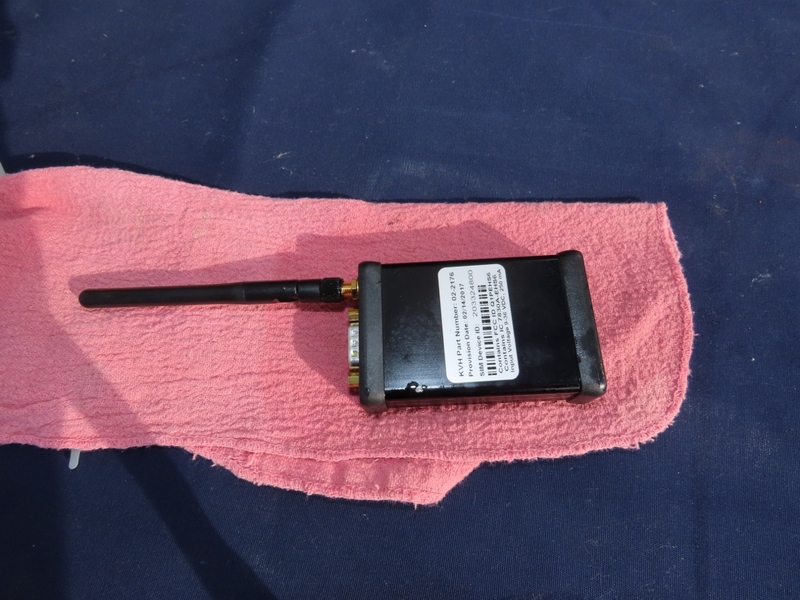 We got lucky this morning though, and James found a loose connection at the antenna ICM (Integrated Combox Modem). Here James has the connection apart for service. It was relatively easy to fix and is now error-free. It also seems to be hooking up more quickly. Isolating shore power from on-board electrical systems is important to avoid excess corrosion and, even more importantly, to avoid risk of shock in and around the boat. 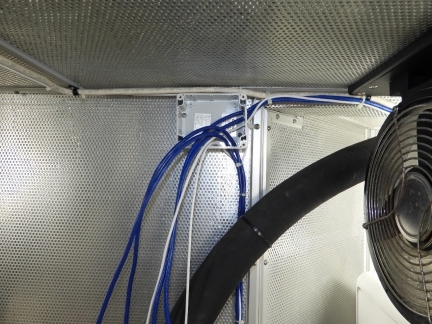 Two common approaches to isolation are galvanic isolators and isolation transformers. 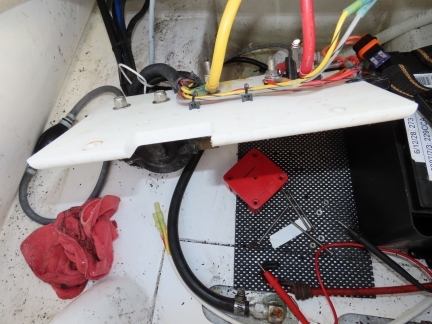 Isolation transformers have many advantages and often are installed in Nordhavns, but have one potential downside though: when first plugged in, a substantial but very short current in-rush can occur that can trip shore breakers. It’s no big deal, in ten plug-in attempts, it may only cause a problem once or twice with a 16A connection and it’s never a problem when plugged into higher-rated shore power connections. 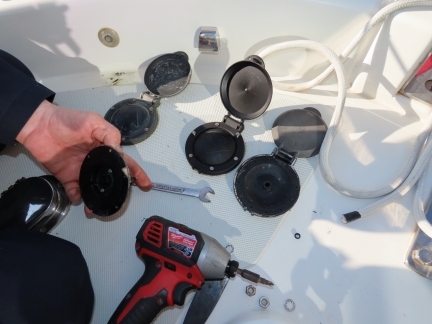 Many boaters will never plug in an isolation-equipped boat to 16A or less and, for those that do, it only rarely trips a breaker and a simple reset will clear it. 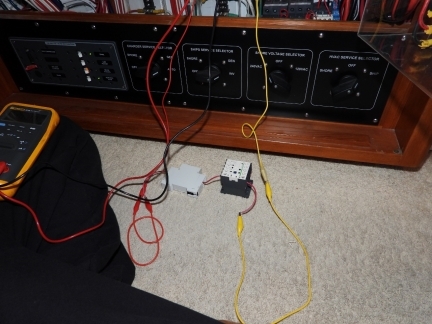 Here’s James is testing part of a resistor-based soft start system. The complete install is described at Soft Start. Taking delivery of an order of antifreeze. 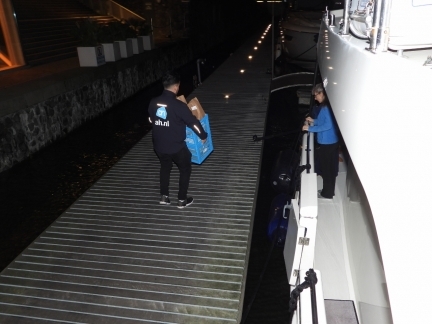 We’ve been struggling a bit with shipping heavier items to the boat, as the marina doesn’t have an office and their address isn’t registered with the local postal service. The adjacent hotel will accept letters and smaller packages for us, but we don’t want to hassle them with something this heavy. 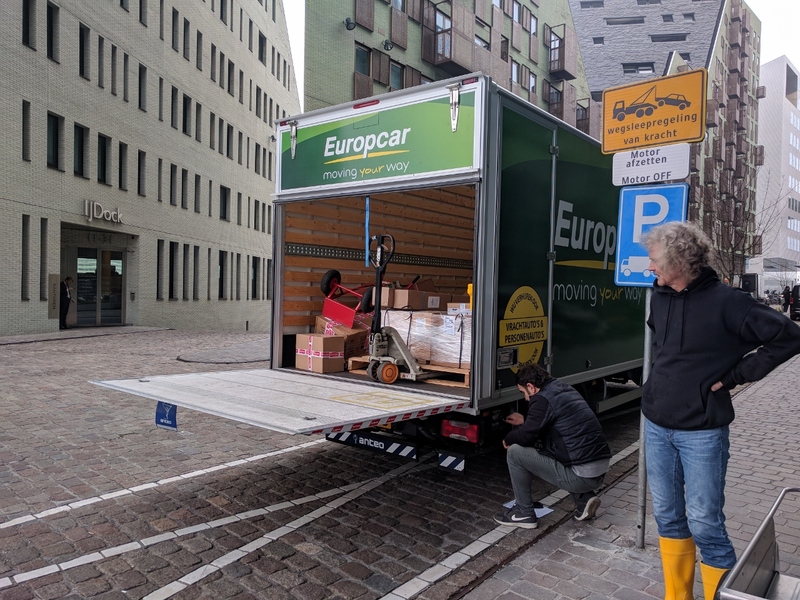 After the local courier couldn’t find the address to deliver this jug of antifreeze, Jeff van der Jagt (behind James) of Filtersystemen Nederland offered to deliver it in person. Impressive service. 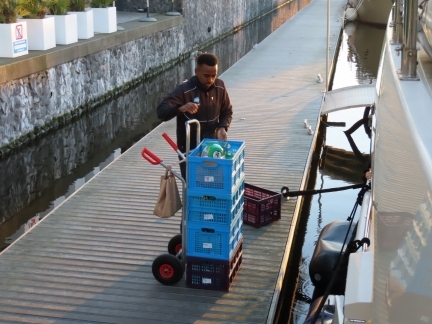 An early-morning delivery from Albert Heijn grocery store. You can tell we’re a ways north—sunrise isn’t until 8:45am. The delivery went much more smoothly than the first. With our new Maestro debit card, the payment was processed without issue. We’d ordered some engine oil from Amazon Germany a few weeks back, and the local courier failed to deliver it yesterday. We’d already had two orders returned to the shipper when the local courier was unable to deliver to the marina and were expecting this too would fail, but amazingly, the four 5-gallon (20L) pails arrived today. We really wanted this particular oil Shell RIMULA R4L for several reasons: 1) the circular pails fit well in our oil storage area, 2) it’s a high-quality ACEA-E9 oil and 3) the price is excellent at EUR 84.09 per 20L pail. Obtaining the circular pails is getting harder in many geographies, where each company is using their own proprietary-shaped 20L container. 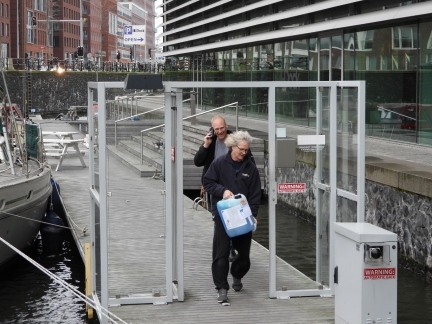 We need secure storage when we’re in rough waters, so it’s far easier for us to use a standard shape. We planned to head out in the tender to view the Amsterdam Light Festival the way they are best viewed: from the water. But the tender battery was flat. We’ll investigate the cause of the problem tomorrow but, for now, we just want to get underway. 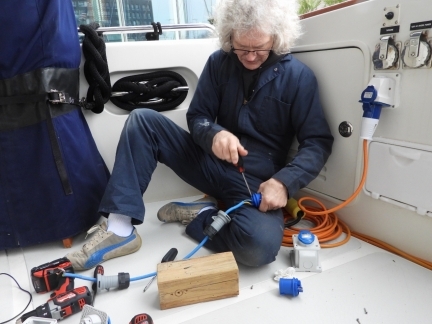 We keep a spare battery on our tender so that we won’t be stranded by a circuit left on or a failing battery. 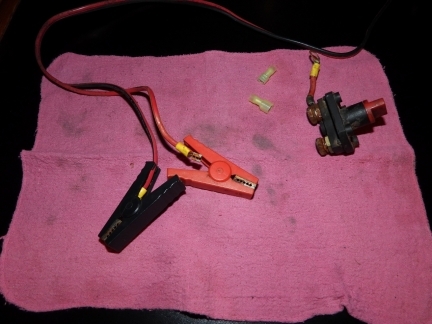 We quickly connected it up and found that the off/on switch on the battery jumper system had failed. Again, we’ll solve that problem tomorrow but, for now, we just want to get underway. We keep tools on board the tender so that we can deal with simply mechanical problems like this one. So, I switched to the spare battery we keep on board, started the engine, and we headed out to see the lights of Amsterdam. 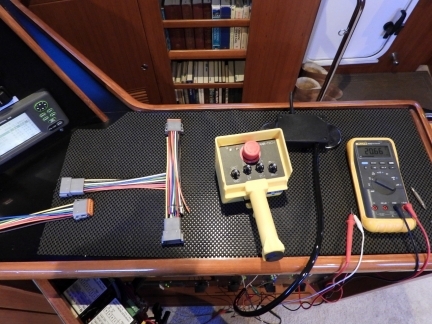 The picture shows our current setup with the spare battery on the left (normally kept in a plastic box) and the black battery box of our primary tender battery on the right. The battery was flat on the tender last night. We switched to the on-board spare and continued the trip. This morning we’re charging up the flat battery and testing it. After charging, it tested out as still having 183 CCA (cold cranking amps) which is close to normal. It looks we can continue to use this battery but, each time a battery is fully discharged, it’s life is substantially reduced. 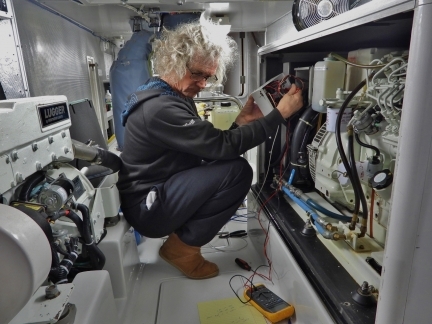 Investigating the cause of the battery discharge, the problem was operator error—we had left on an accessory switch. 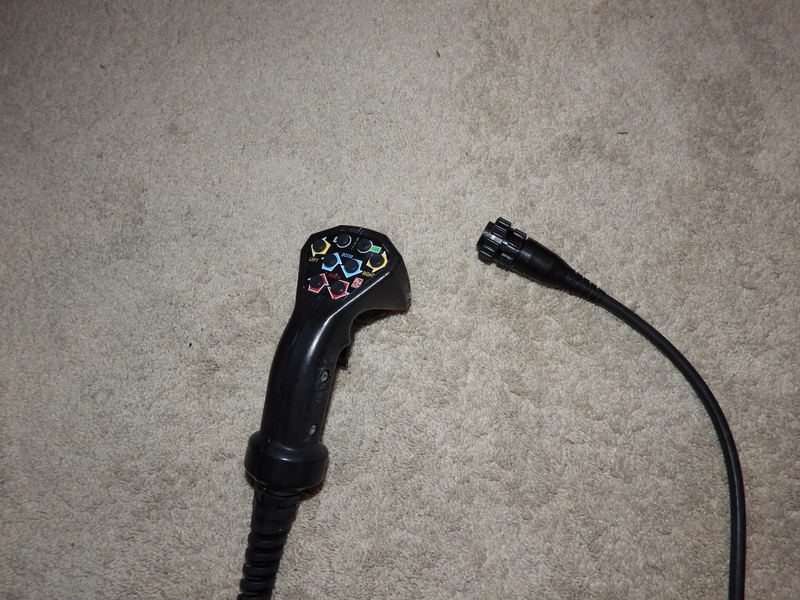 We’ll need to put that accessory switch on ignition-switched power or be more careful in the future. We’ll likely make the change to avoid the problem in the future. 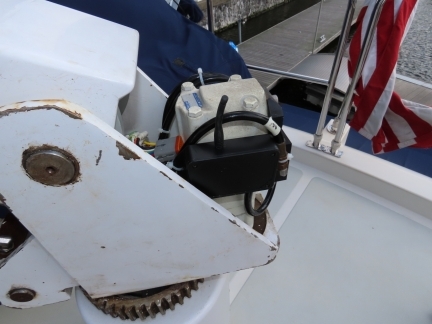 Since we have a backup battery on-board, this problem wasn’t a big issue and didn’t slow us down much. The second problem we had last night is when attaching the backup battery jumper cables and turning on the switch, the motor still wouldn’t start. 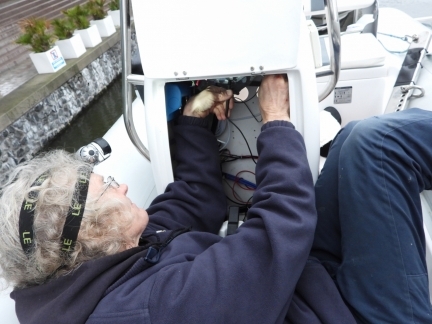 We installed the spare battery without investigating the problem so we could get underway. But, in checking this morning on the problem, we found the off/on switch had failed. 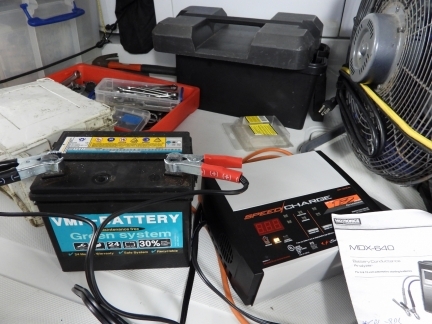 The history of our tender backup battery system is a long one. We originally purchased a commercial battery boost system and it worked well for a couple of years before its battery needed replacement. 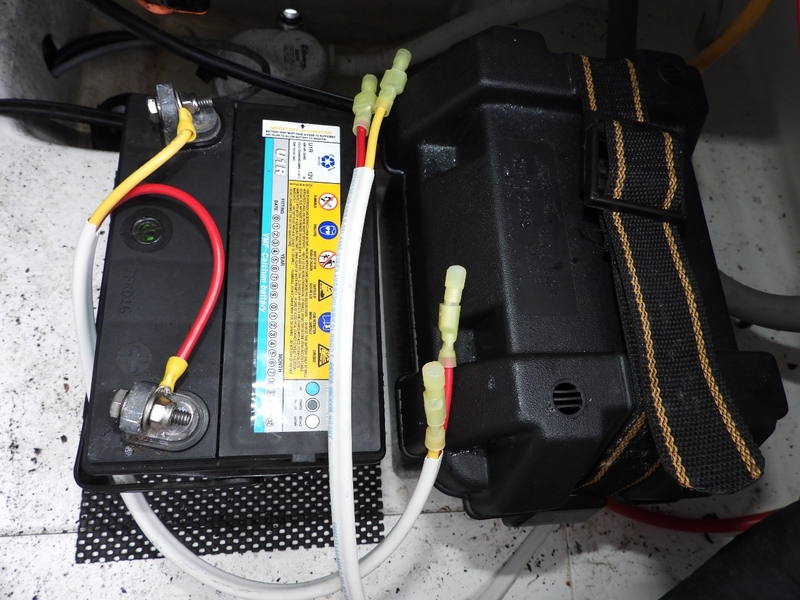 We took apart the commercial boost system and replaced the battery and it again worked for another couple of years, but the battery is a very small battery and it really can only be used once or twice. So, we took the jumper cables and switch off the commercial battery boost system and put them directly on a second battery exactly the same as the one used on the tender. This worked far better and has been the system we’ve been using for nearly four years. But the last remnants of that commercial battery boost system have now failed. The off/on switch is no longer operative. We’ll replace them with direct wiring without a switch. 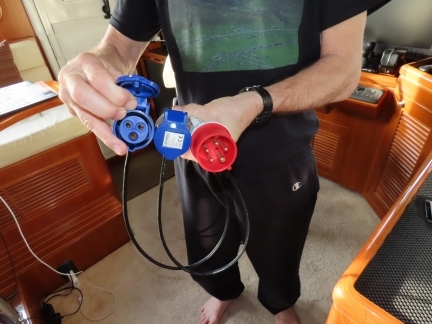 One of the reason we liked the old battery boost system is we could just connect the jumpers, turn on the switch, and start the engine. When not in use the switch was off and there was no risk of the terminals touching together. But, predictably the switch failed. For the new system we’ve gone with an even simpler design where each battery has 12-gauge wires with connectors on the end. We have dummy connectors installed on each to keep the water out and to prevent shorting. When needed, we simply remove the dummy plugs, attach the two wires together and we are in “jumped” mode. Another nice feature of this approach is we can charge or test both the primary and the backup batteries without taking the batteries out of their enclosures. Jennifer returning back from grocery shopping with a full load. 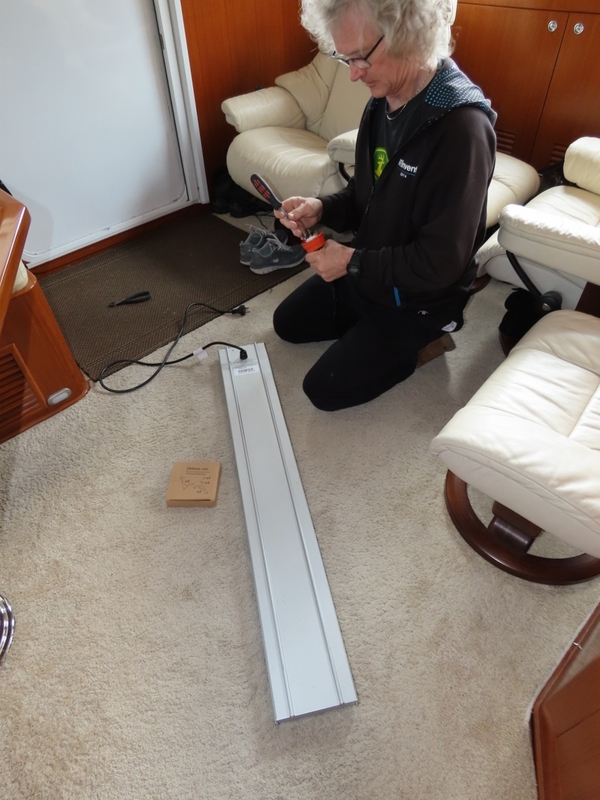 James installing new mounting brackets for the slightly larger side lights that we’re upgrading to. 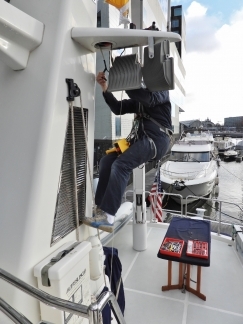 Here he’s hanging from the crane, since that’s the only way to access the aft side of the lights. 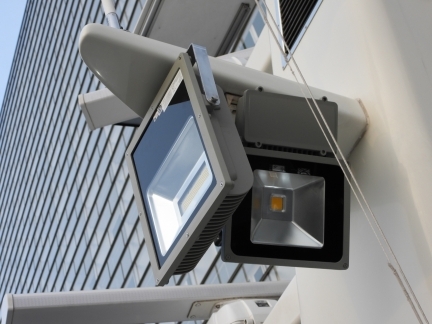 We’re moving to a slightly higher output light and that requires a larger support bracket. 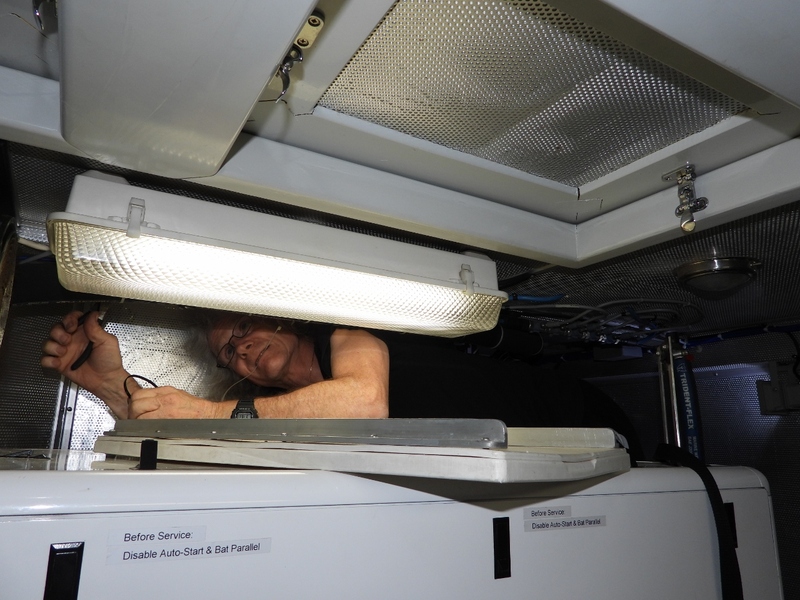 In the picture he’s got the bracket fully installed and the new light temporarily in place (rightmost) while he checks the wire length. 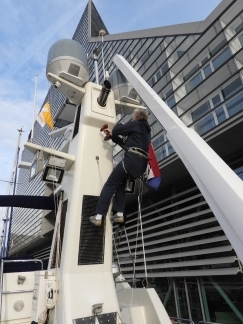 To avoid growth build-up, we run the hydraulic thrusters monthly. This the wash the forward thrusters throw underneath the dock and over to the marina wall, about ten feet away from the boat. 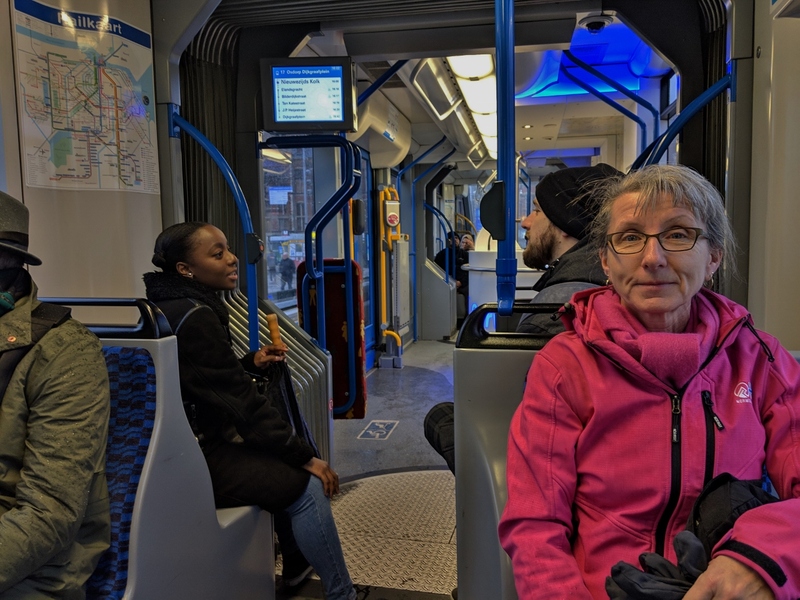 Taking the streetcar to pickup our new glasses from Specsavers. This the fourth form of public transit we’ve taken in Amsterdam. The others were the Metro subway, and the Sprinter and Intercity trains. 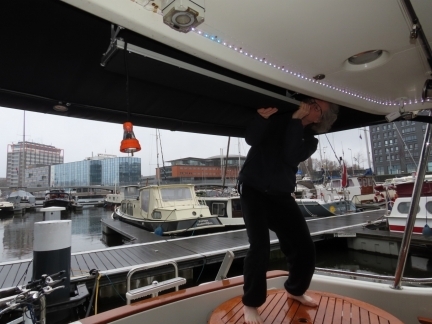 Earlier in the week we installed the new mounting brackets, now James is installing the slightly larger side lights that we’re upgrading to. Here he’s working on the wiring through a pie-eye at the base of the winglet that supports the lights. 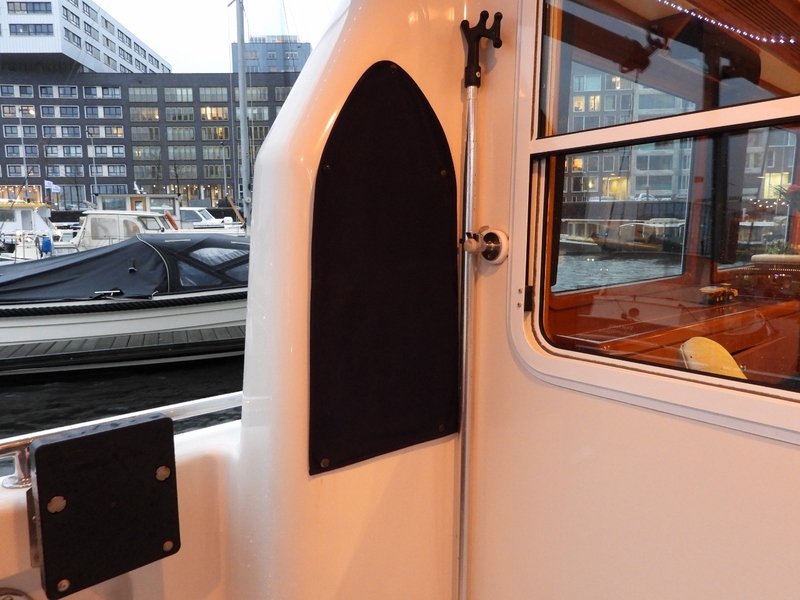 The new side light in place, with the older style they are replacing still in use for the aft-facing lights. 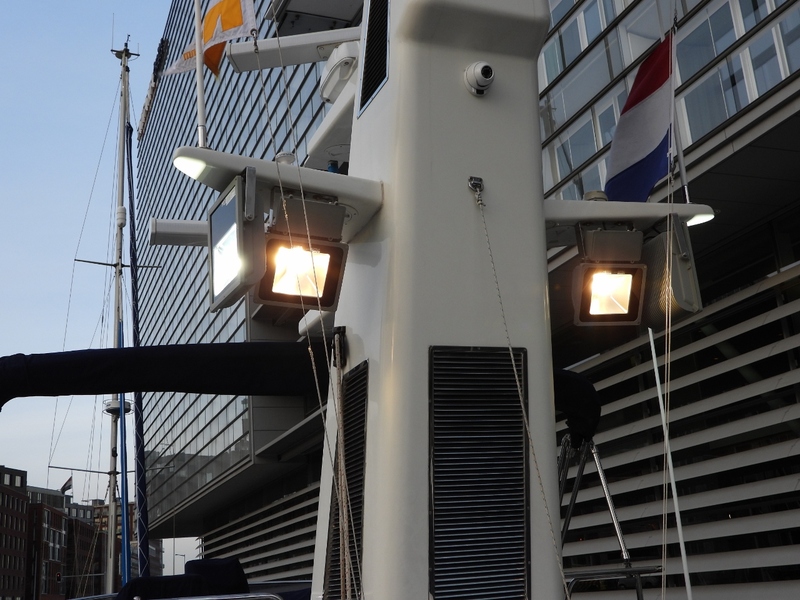 Testing the side and aft facing lights. The new side lights are a little larger than the aft-facing ones, but are double the wattage at 150 watts versus 70. We did a quick test at night and the side lights could easily illuminate the street several hundred feet away. 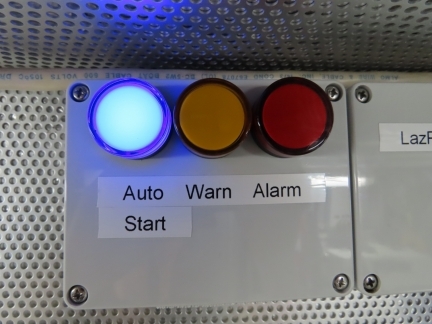 Whenever an autostart engine is worked upon, the autostart must be shut off. 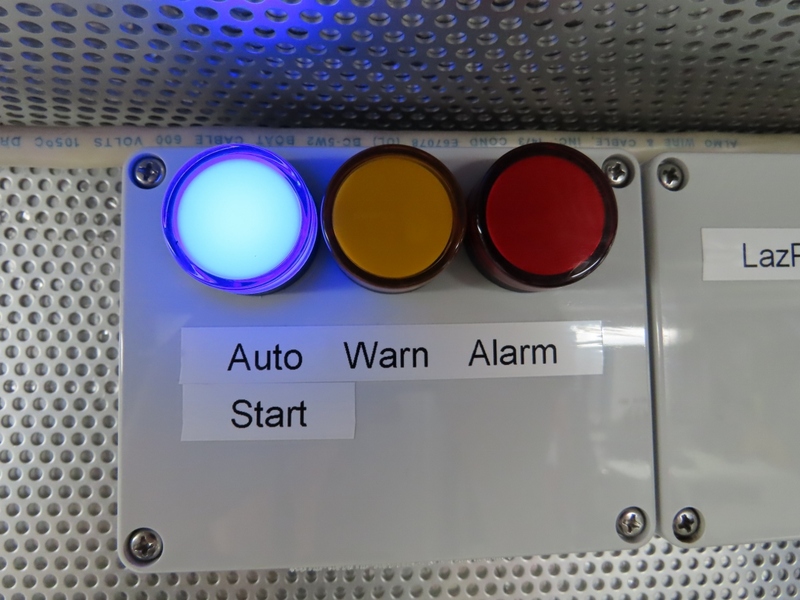 There is a possibility that it might accidentally be left off, so some additional protection is afforded by warning when autostart is not currently on. Here James is installing the autostart detect circuit in our Northern Lights Wavenet (very similar to the current North Lights TSC). This system has been so useful that we wanted to add another keypad and display for the engine room. 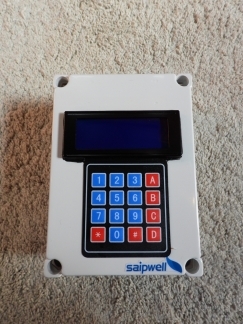 The first step of this project is assembling of a control box to house the 4×20 character LCD display and the 4×4 Matrix keypad. This is the finished product. James running wires from the lazarette Raspberry Pi to the engine room control system display and keypad. 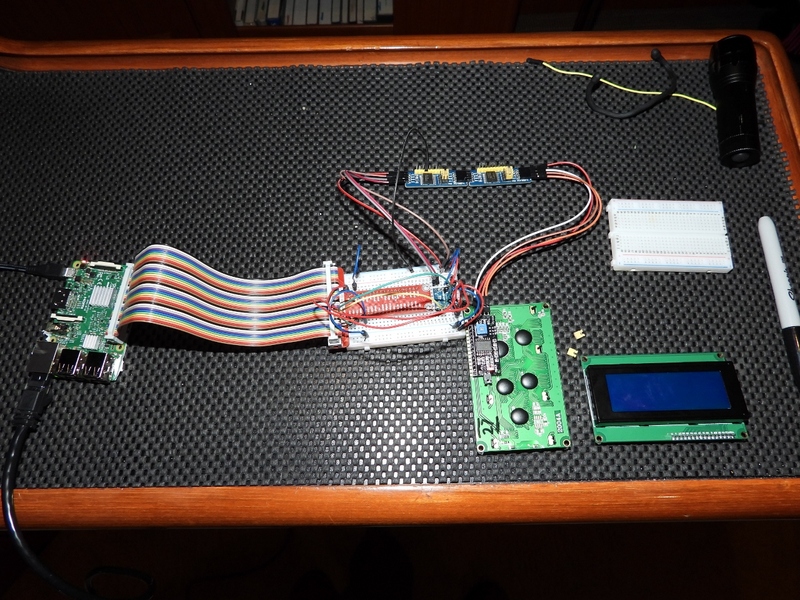 The display requires 4 wires (5V+, 5V-, and 2 i2c signalling lines) and the keypad requires 8 signaling lines. James testing the i2c signalling that will be used to run the engine room control system and 2 devices each providing 8 pins of digital I/O. 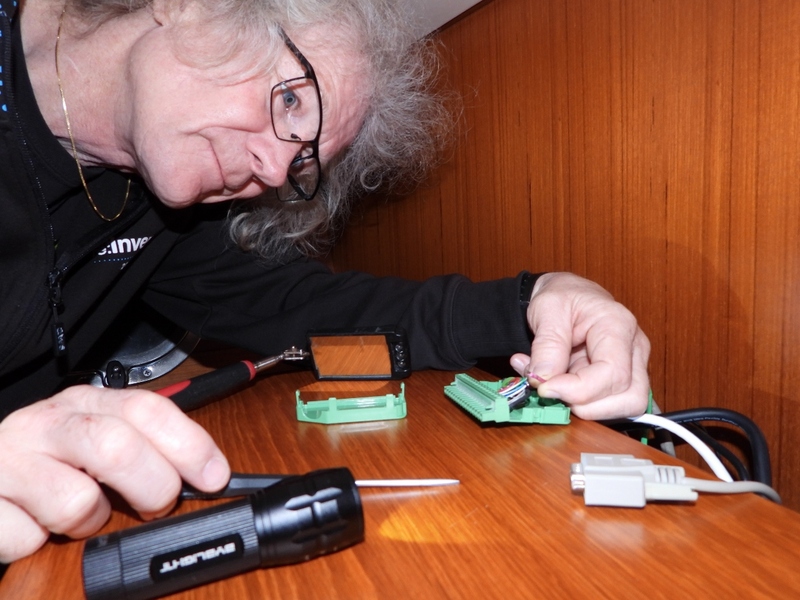 He normally tests using a spare Raspberry Pi before installing the final solution in a more difficult to access location. The new engine room remote control display and keypad box mounted with wiring roughed in but not yet connected. 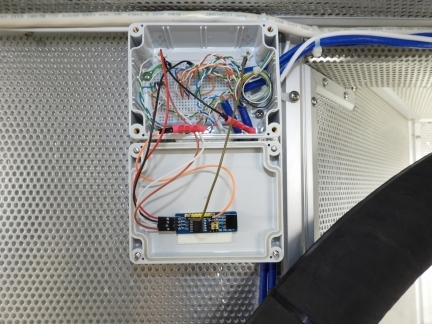 A junction box with roughed in wiring above the generator that will house an i2c to 8 channel digital I/O converter and allow access to all signaling wires between the lazerette Raspberry Pi and the engine room display and keypad. 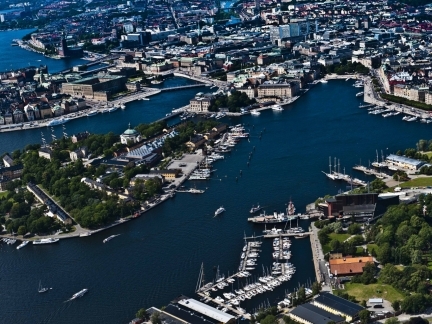 We’ve been researching some of our stops for this summer’s Baltic cruise and are planning to spend a few weeks in July at Wasahamnen Guest Harbour in Stockholm. 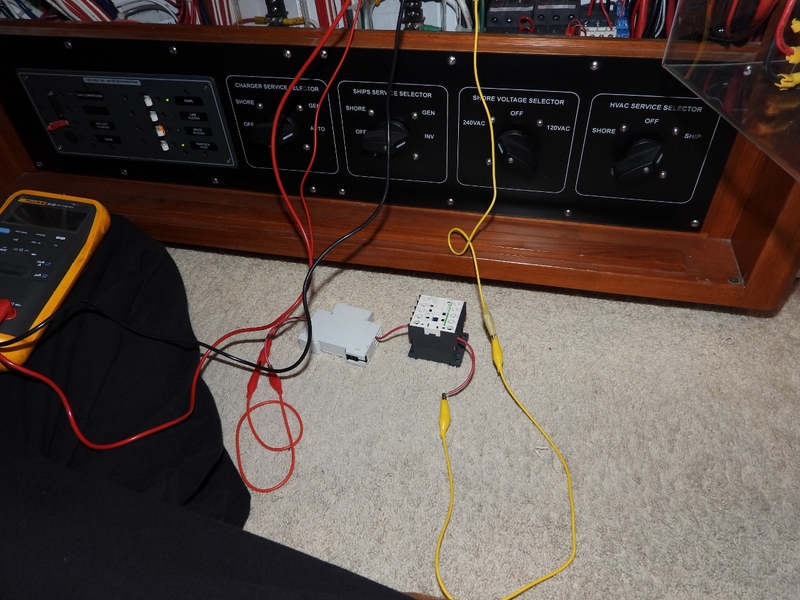 The completed junction box open with final wiring complete. 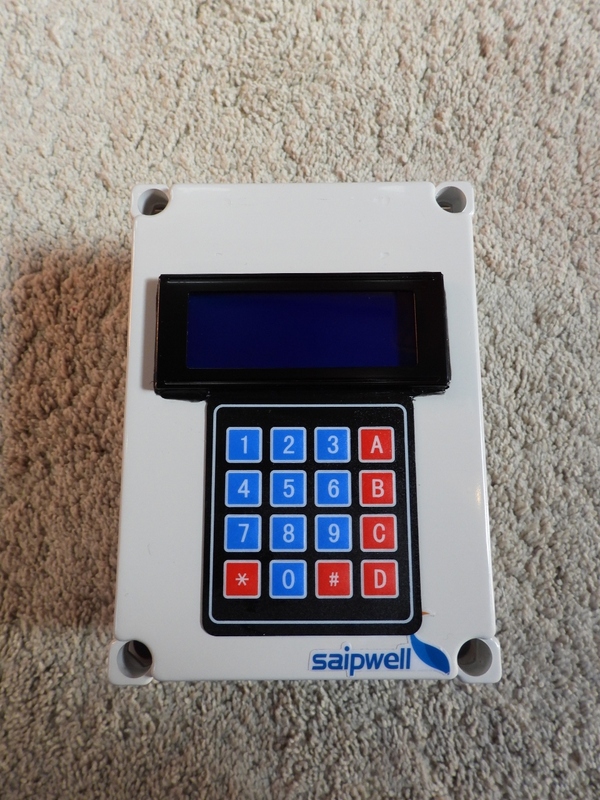 The completed engine room remote control keypad and display mounted. 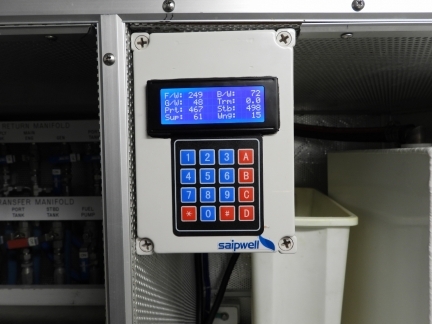 We can now control remotely control our automation systems from the engine room and also view the various status displays. Waiting at Amsterdam Stadsloket Zuidoost (City Desk Southeast) to register as a temporary resident to obtain a BSN (burgerservicenummer), a Citizen Service Number similar to a Social Security Number in the US. 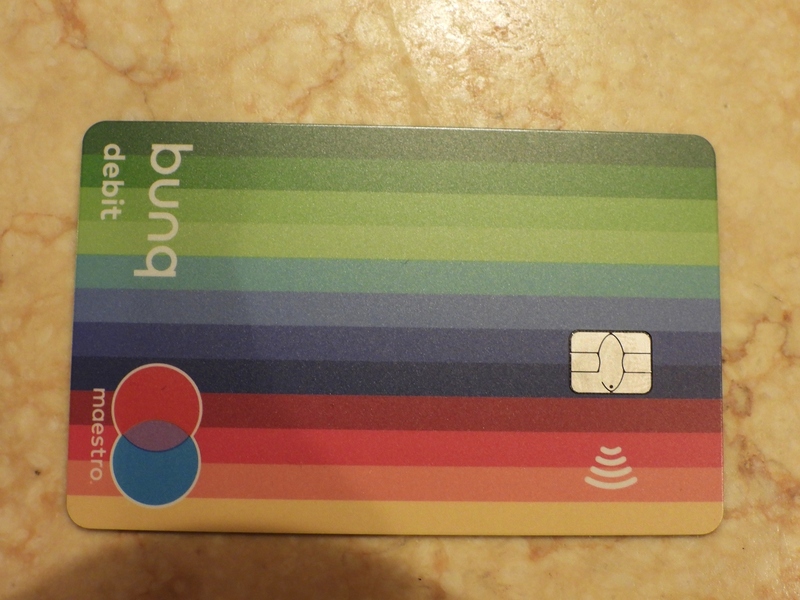 It turned out that we needed one to keep our local Bunq bank account active. The high winds blew our large forward inflatable fender from the water up and onto the boat. 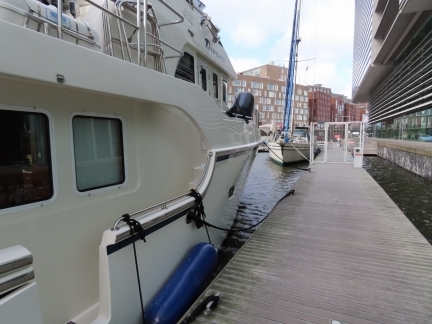 We’ve since secured it with a line to a dock cleat. Our heavy Polyform F8 fenders didn’t budge. 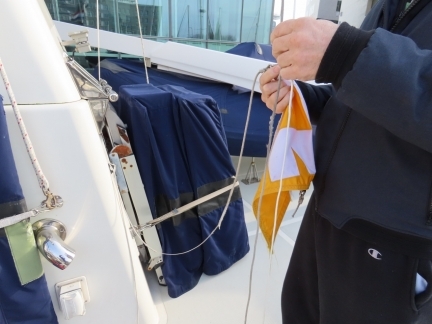 The line supporting our Nordhavn pennant had frayed to barely a thread, so we replaced it today. 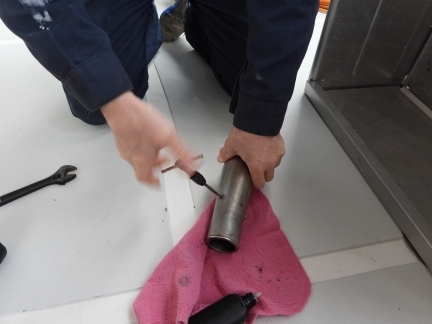 A common problem determination technique is to replace a suspected bad component and, if the problem is corrected, then you know that component was at fault. But this technique is not perfect—sometimes new parts are bad. 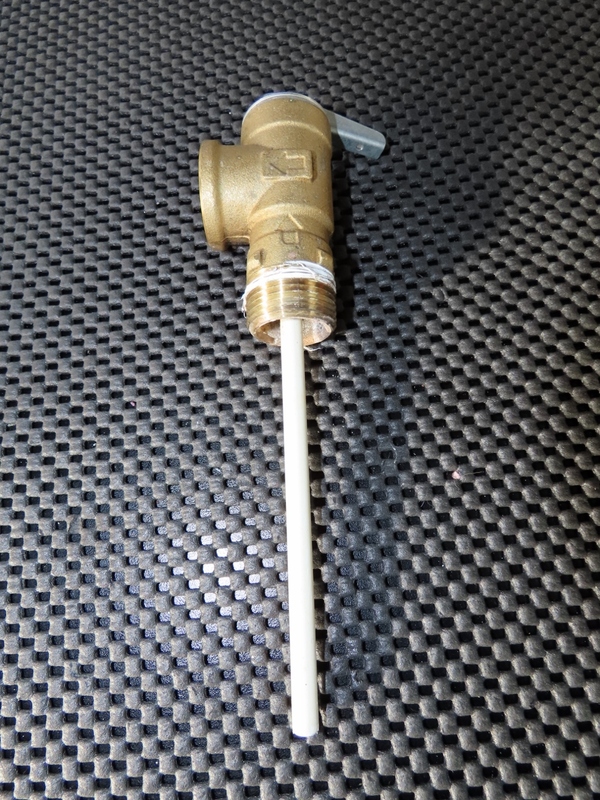 Six months back water was leaking out of our hot water heater so we replaced the Temperature and Pressure (T&P) valve. It continued to leak so “obviously” it wasn’t a T&P Valve problem. Many recommended that we add an accumultator tank to the system. This seemed quite logical to us, so we got to work on adding this component. 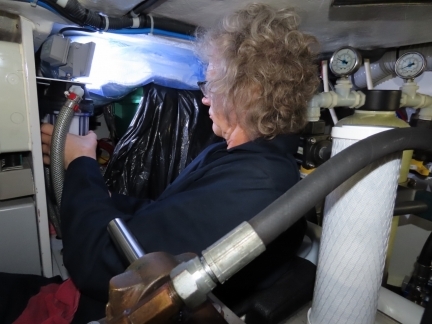 We spent a bit of time choosing an appropriate accumulator, figured what fittings we would need to install it, and found a location in the boat where we would just barely be able to fit the fairly large tank. We were very near to installing the new equipment but just kept thinking that the fault mode sure looked like a failing T&P valve. 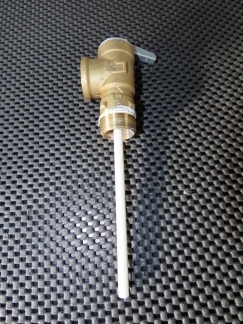 Because it was easy and cheap, we replaced the T&P Valve valve a second time and the problem was completely solved. The original problem was a failed T&P valve, the new one was also faulty, and the second new one solved the problem. We wasted some time on this one and it’s an example that “try a new part”, although often a good quick diagnosis technique, is not perfect. The new part could be bad as well. Amazon doesn’t have a Netherlends site, but the UK and German sites will deliver many products here. 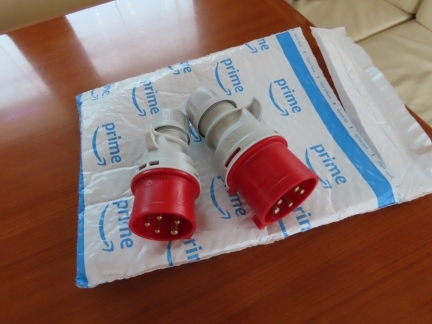 And quickly too—we ordered these two 400V plugs from Amazon Germany and they arrived in two days with standard shipping. To give us more flexibility in shorepower sources, we built a pigtail that will produce two single-phase 16A connections from a single 3-phase 16-amp 400V source. 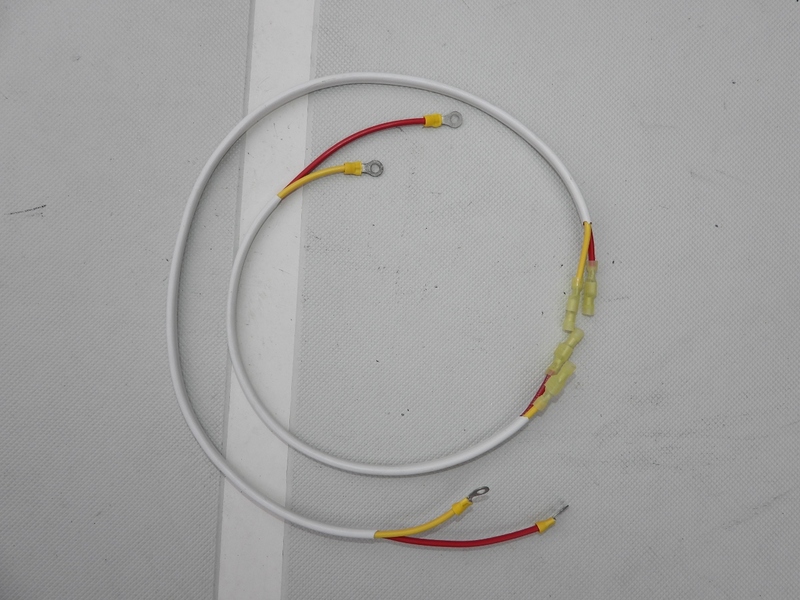 This second pigtail produces a single-phase 32-amp 200V connection from a three-phase 32-amp 400V source. We’re still a few weeks away from departing Amsterdam, but are starting to stock up on staples with a delivery from Albert Heijn this morning. 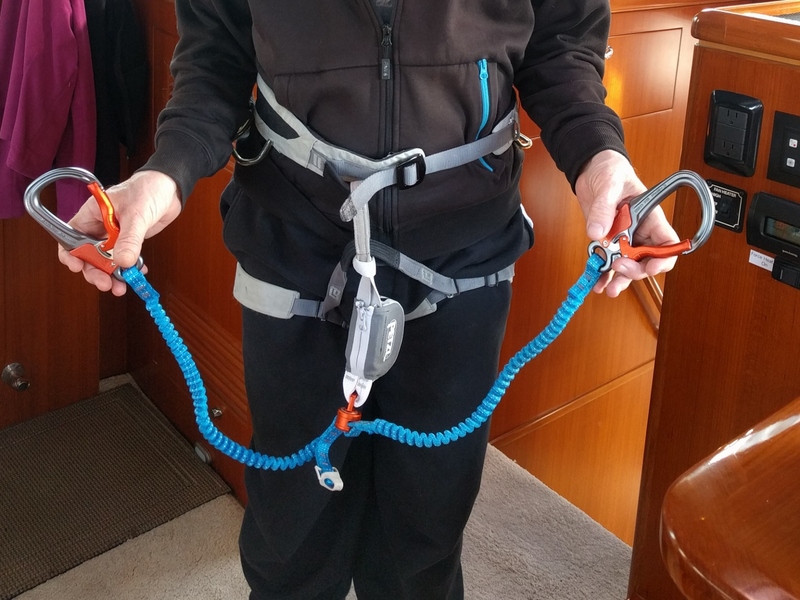 In doing a couple of Via Ferrata climbs this summer, we learned that our standard climbing equipment wasn’t ideal for short-distance falls where the rapid decelaration can exceed the rating of normal climbing gear (in mountaineering terms this is called a high fall factor). So we purchased energy-absrobing lanyards to replace the standard climbing equipment we use for safety gear when clipped on to the stack. Besides being safer in a fall, the dual-lanyards means we never have to unclip entirely to reclip, and the automatic-locking carabiners are quick and easy to snap on. We’ve never been thrilled with our Jabsco 34600-0010 bilge pump. 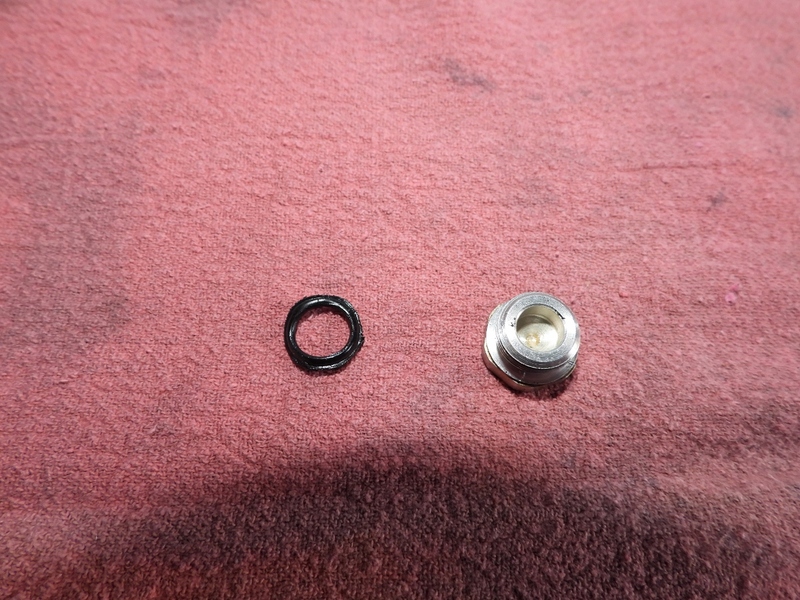 These pumps have a few weak points, the most annoying of which is the inlet and outlet valves have ferrous metal rivets that hold the rubber flapper in place. Unsurprisingly, these valves fail and testing annually really isn’t sufficiently frequent. But, even if you test them daily, they can still fail an hour later. The only way to trust these pumps is to change the valves frequently. Another problem is the Bakelite pump base can crack if over tightened or if tightened unevenly. The one feature we like about this pump is that it can self-prime even when the pickup is several feet below. But after the pump failed during our 2017 North Atlantic crossing, we became even less happy with it and decided to replace it. 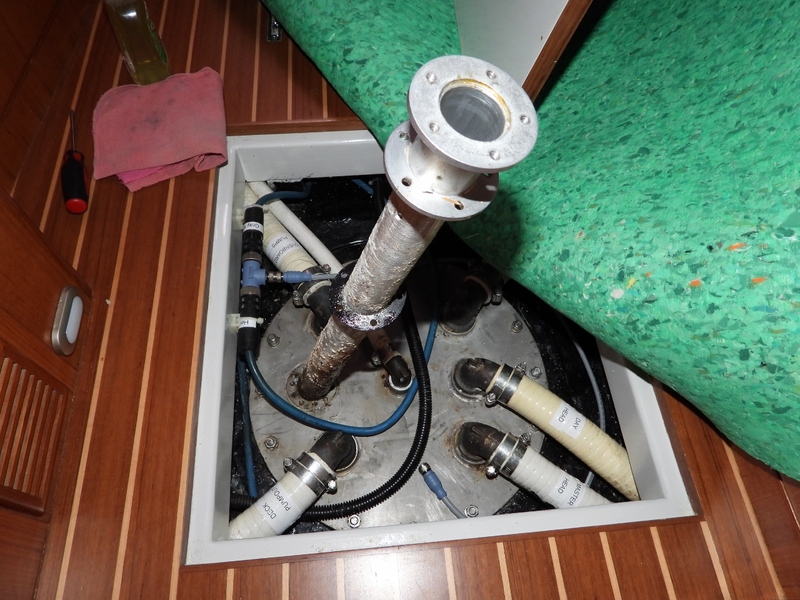 Here’s the pump removed from its install point in the starboard engine room alcove. We replaced the Jabsco 34600-0010 bilge pump with Whale Gulper 320 High Capacity bilge pump. The Gulper is a nice, simple design and looks well-engineered. 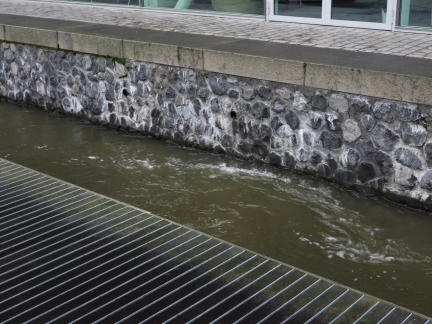 In testing, it will pull water from several feet below, even into a dry pump. And output volume is quite good. We had to cut and move some hoses to install the new Whale Gulper pump, which resulted in having to modify the floorboard slightly, but the job now is complete and we’re happy to see that Jabsco 34600-0010 bilge pump off the boat. We have five Dometic HVAC systems installed on Dirona and each has a dust screen that needs cleaning regularly. Here James is vacuuming off the dust that accumulates surprisingly frequently when they’re in heavy use. The guest stateroom HVAC system wasn’t producing heat and on investigation we found it was covered in ice. Some ice is normal for operation, but not this much. The water temperature is 49F which is close to where they struggle. We put the system to 65F and put blew hot air onto it to warm the thermostat to cause the AC to run. 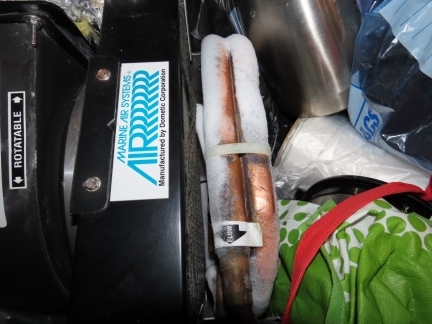 We let it run for a minute or so and this de-iced the system after which the heat produced was up over 100F. It appears the system was close to its minimum operating temperature and just froze at startup. 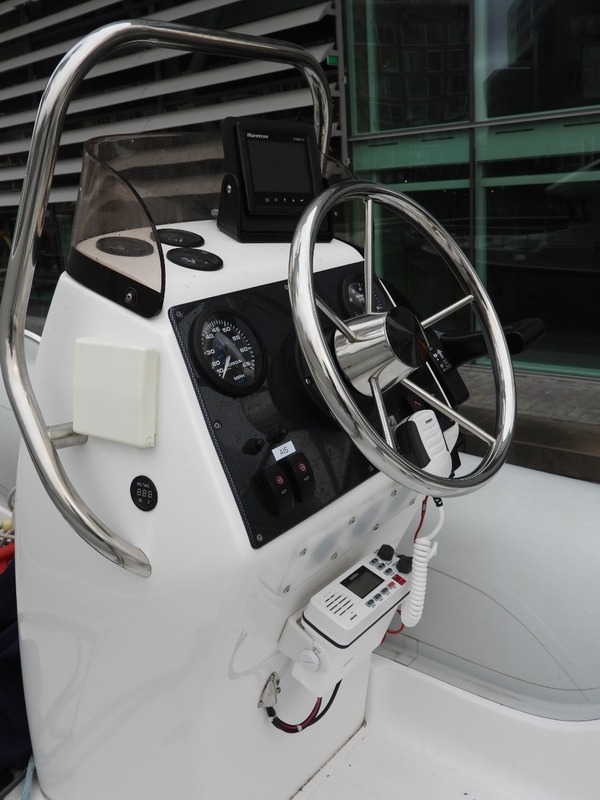 Our new radio on the tender now receives position data from our new Vesper Marine AIS XB-8000. The radio accepted a different baud rate than the AIS transmitted by default, but we were able to change the transmission speed using Vesper’s mobile app. 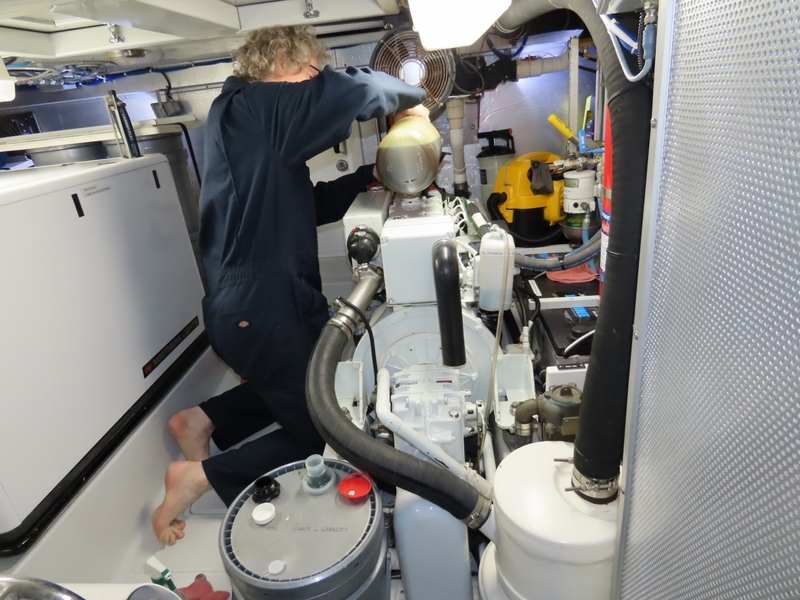 Performing the at-least annual battery condition check on the tender main and spare batteries. We’ve made it much easier to test the batteries, and, because we can now can test them without taking the covers off we tend to do it more frequently. We moved all loads, including the bilge pump, to the switched side of the tender battery switch. 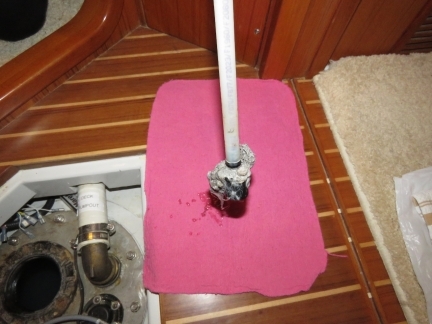 This will prevent the bilge pump from clearing the bilge when not in use but we mostly keep it out of the water with the transom plug out. 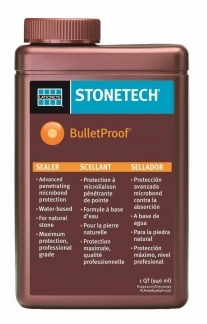 This ensures that the batteries only have to deal with self-discharge. A flat battery in a remote location could be a really big problem so we carry an entire spare battery everywhere we go. 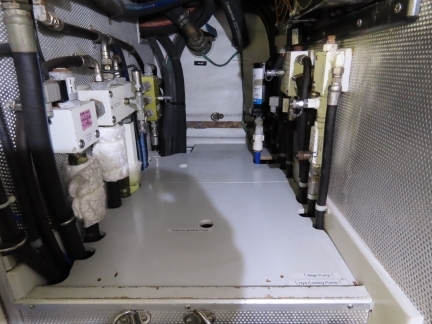 And if we’re leaving the tender for an extended period of time, we’re also careful to shut off the electrical system so the batteries don’t discharge. 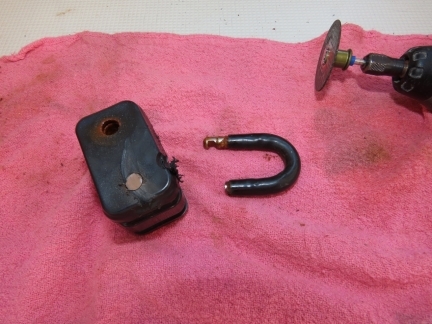 One of the padlocks that we use to secure our scuba tanks to the transom had corroded to the point where the key no longer worked. We had to cut it off with a Dremel cut-off saw. Jennifer returning with an order of cat food that was just delivered. 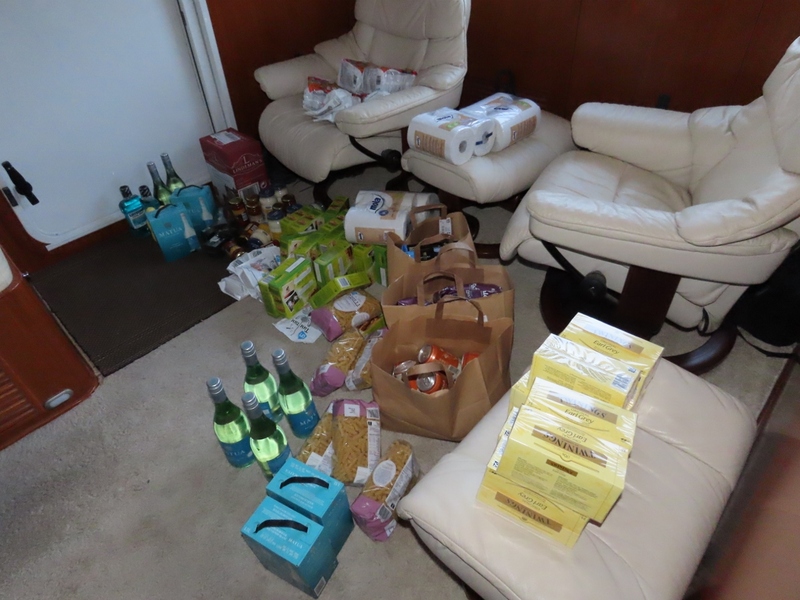 Spitfire has developed kidney problems and now needs to be on a special diet, so we’re stocking up on enough food to get us to Stockholm. 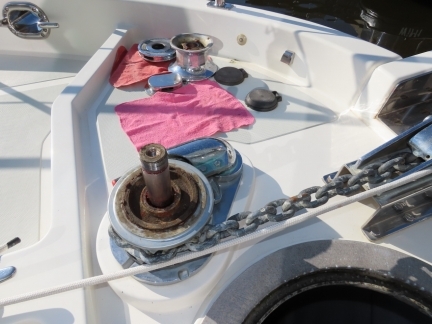 Every year, we dissemble and grease the windlass top end. The windlass “up” foot control switch has been failing recently, so we replaced it with a spare. 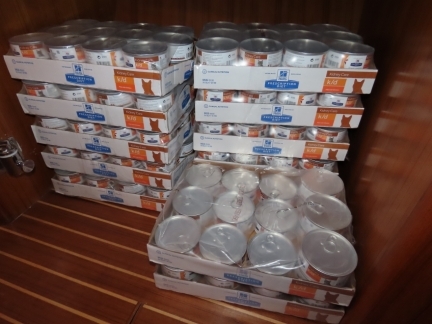 The eleven cases of cat food we had delivered fit nicely under the guest stateroom desk. We placed each stack on a non-skid base and secured each case to the one below with packing tape so they won’t slide around. The desk chair locked in place will also help secure the stacks. Dirona has a built-in vacuum cleaner installed in the lazarette. 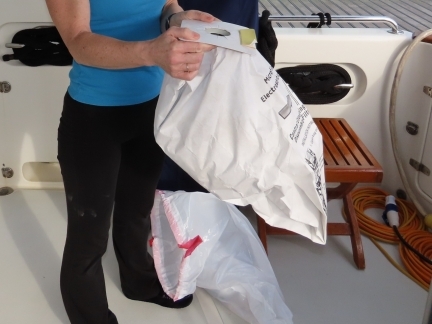 The bags are large and usually take at least a year before they need replacing. 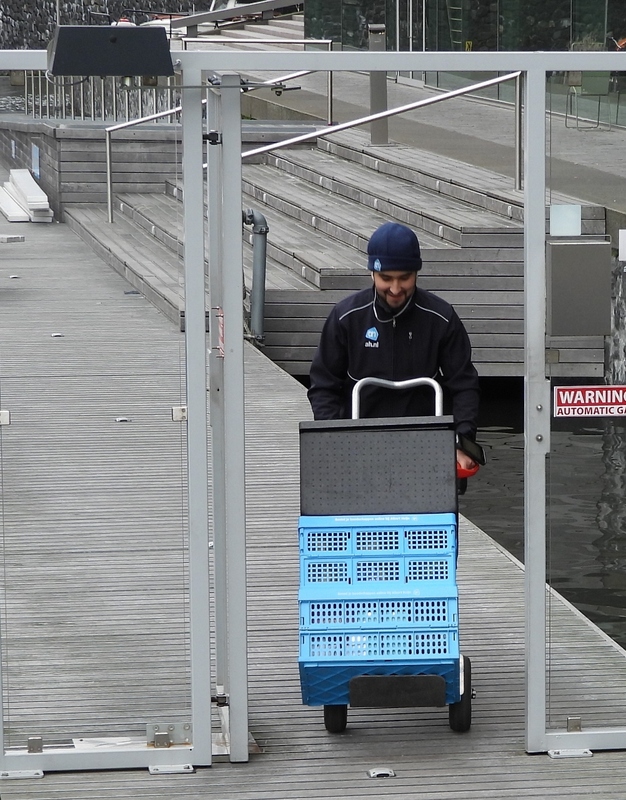 Another big grocery order from Albert Heijn as we stock up for the summer trip. At Keesie Dive to shop for scuba gear. 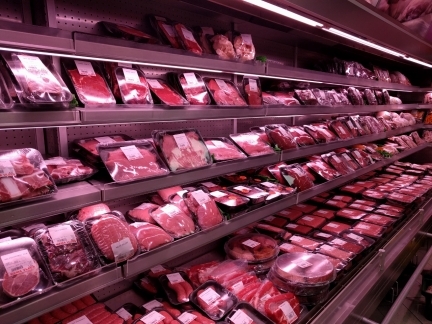 The well-stocked store above is only a fraction of their total space. They have large numbers of storage and work areas down below and spreading out across away from the facility. 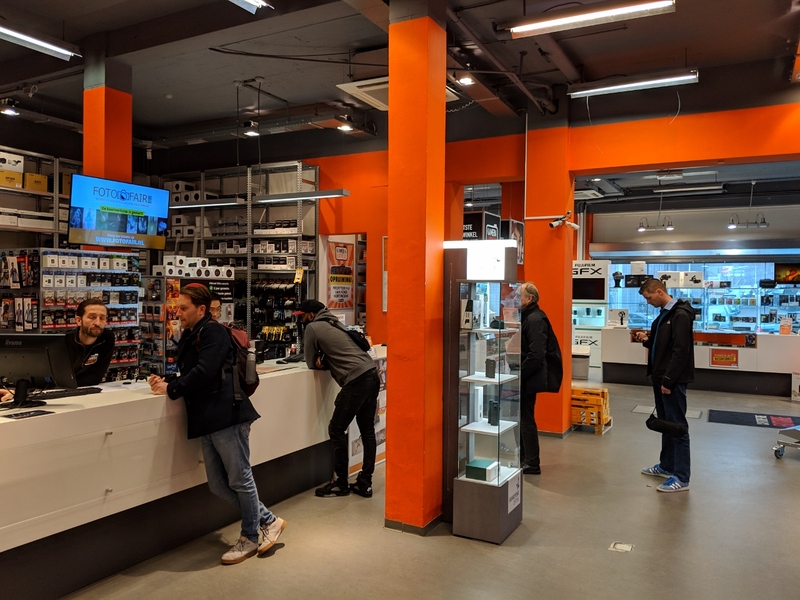 As well as being a general-purpose dive store, Keesie Dive has one of best corrective lenses stocks in Europe—divers come from all over to get lenses. 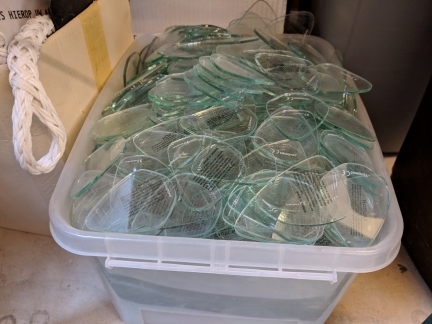 When goggles are upgraded with corrective lenses, the old previous clear-glass lens the goggles came with is discarded. Here’s six months of lens sales at Keesie Dive. We got Spitfire an EU Pet Passport in Scotland in 2017. The passport is recognized in the EU and Norway, and has allowed hassle-free travel the past two years with Spitfire on board. 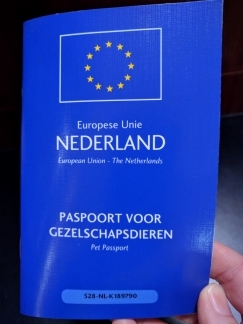 But a UK pet passport no longer will be valid for travel within the EU as of March 30th, 2019 if there is a no-deal Brexit. 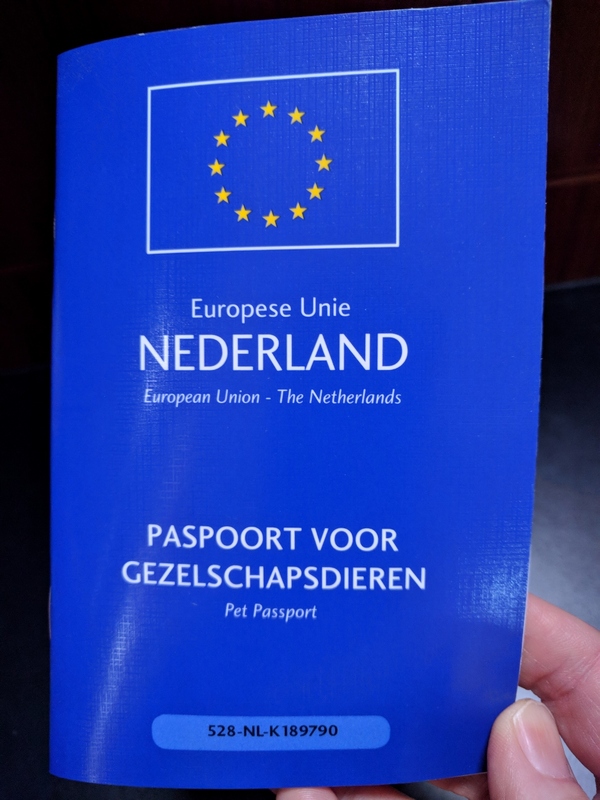 So while his UK passport still is valid, we got him a Netherlands passport with the vaccination information transcribed from the UK passport. At Kamera Express in Amsterdam-Zuid to pickup a spare camera battery, as we couldn’t get a Lithium-Ion battery shipped to the Netherlands from outside the country. In fact, we couldn’t even get Lithium-Ion batteries shipped from the European mail-order vendors that we tried. We got one at the vast Kamera Express outlet here. Our drysuits are nearly twenty years old. We’ve replaced the seals many times, but they’re now to the point where they just leak everywhere and we’ve been planning to replace them. We love warm-water diving, but really haven’t been doing any recreational cold-weather diving. Over the last five years the only cold-water diving we’ve done has been to free up a stuck anchor, clean the bottom, or other boat service. It seems crazy to spend upwards of $2,000 on a good-quality drysuit that will only be used in emergency situations. 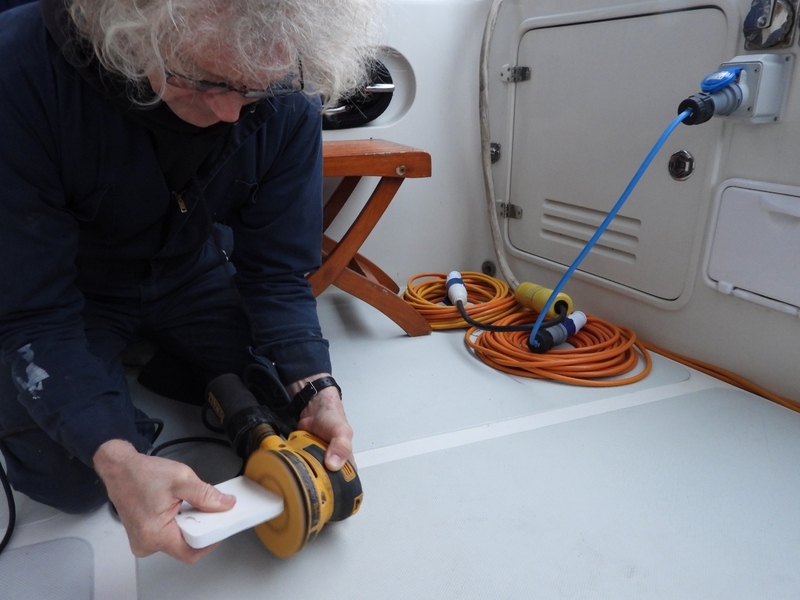 When our anchor was ensnarled in the Orkney Islands in 2017, James dove the anchor in a 5mm wetsuit in 58F (14C) water. Perhaps because the 5mm wetsuit he was using seals quite well, or because the dive was relatively short at only 35 minutes, but the wetsuit did surprisingly well and he wasn’t that cold. An obvious approach is to get a 7mm wetsuit, which would work fine at roughly $250. This would be far less expensive than even a cheap drysuit. 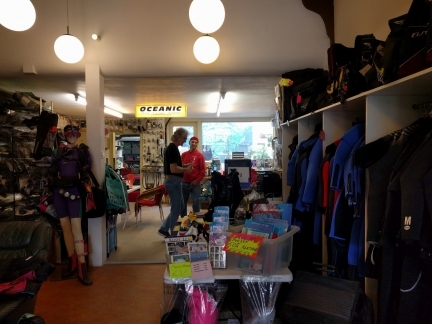 After visiting Keesie Dive yesterday, we decided to take a slightly more flexible approach and returned today with our 5mm full suits to try things on. We bought a hooded 3mm core-body undergarment that can fit underneath the 5mm full suit when more insulation is required. In addition, we got a 5mm shortie that would fit over top of our 5mm full suit. For colder dives we now have a choice between diving wearing the 5mm alone, or any combination of wearing the 3mm undergarment, the 5mm shortie and the 5mm wetsuit. 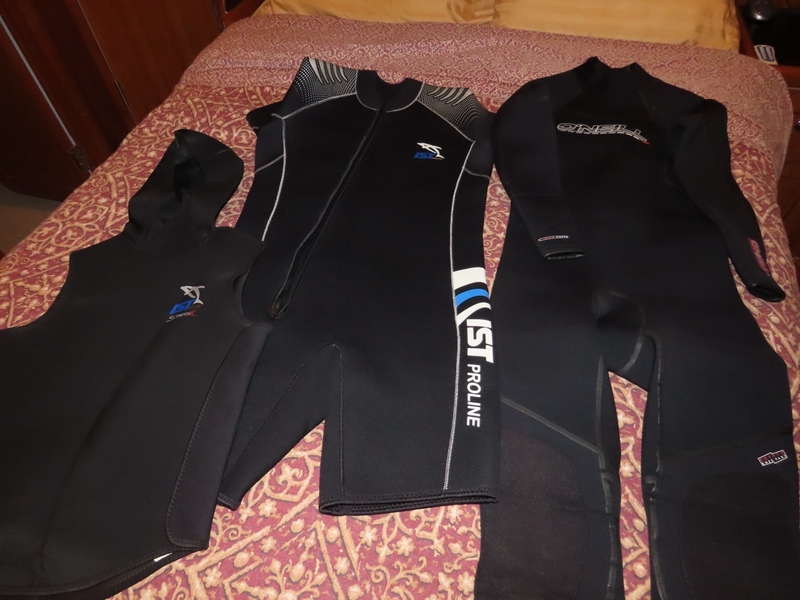 We were able to add those options at less expense than a 7mm wetsuit and a tiny fraction of the cost of a new drysuit, and it offers a fairly flexible solution. James up the mast replacing the V7hts GPRS modem. This cellular modem isn’t mission critical in that it’s only used by KVH to get to the V7 for service but it’s still worth having it working. The failed GPRS Modem removed from the KVH V7hts radome. It appears to have developed a leak and a few ounces of a thin oil leaked out and the modem no longer works. We’d originally mounted the new davit wireless remote control base on the starboard side of the davit suppport, but the crane partially partially blocked the signal between the remote and the base antenna. 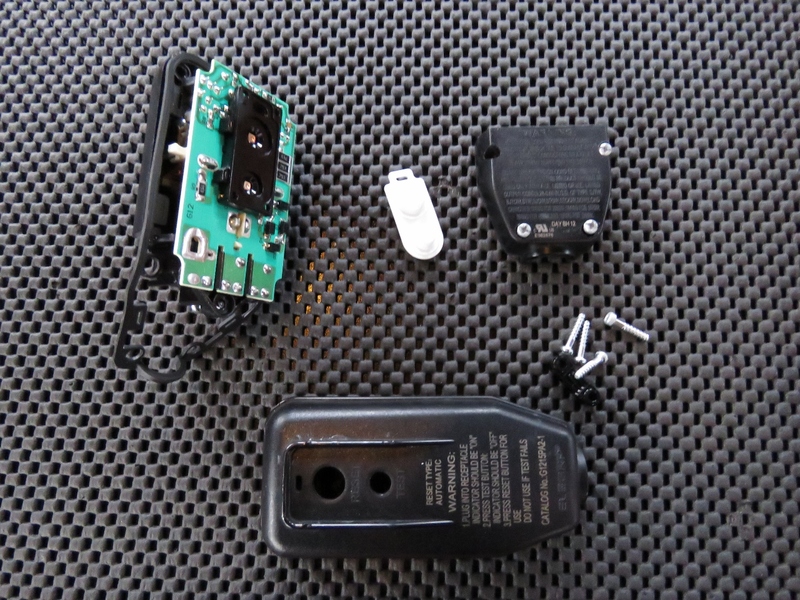 So we removed the mounting magnets to minimize the depth of the package and attached it on the swing motor with the antenna up above the heavy metal components. 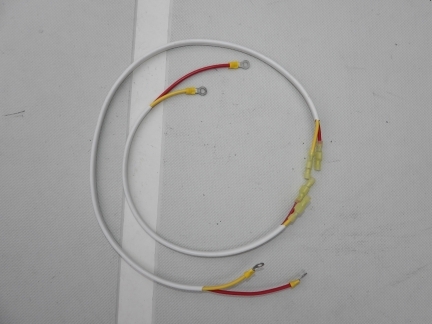 Have you ever wanted to find a specific wire in a large wire bundle? Since wires are seldom labeled in the middle, it can be hard to find the one you are looking for. 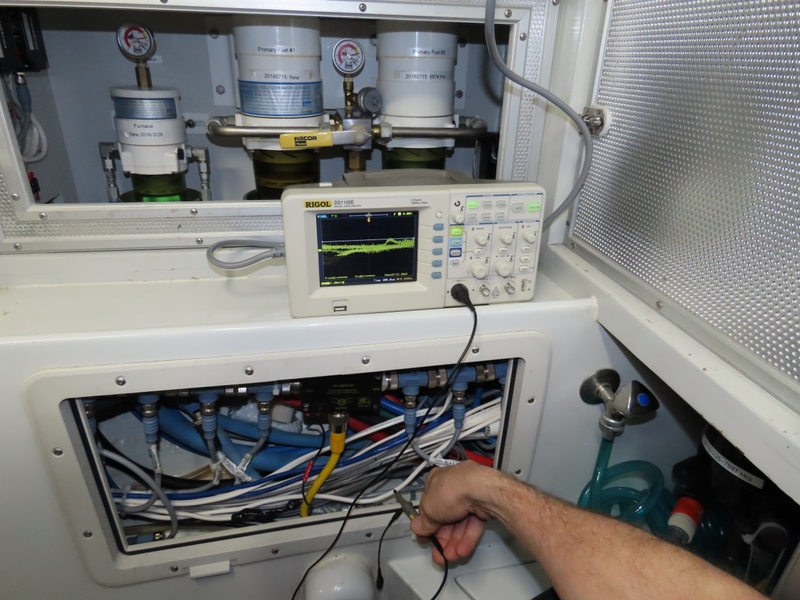 Here James is looking for a specific signal that is carried by one of the wires in this bundle, but which one? Pulling an additional cable would solve the problem but that would take a half day. He had a good idea that worked very quickly. He disconnected both ends of the wire being searched for, put an alternating voltage on the cable, and then found it using an oscilloscope lead. What’s kind of surprising here is the alternating current signal isn’t grounded and James is just touching the oscilloscope probe against the insulation on each wire. If the AC current is turned off and on, it’s easy to confirm the oscilloscope lead is touch the outside of the right wire. It’s a fast solution that we’ll definitely use again. We heard a loud bang today and went aft to find our Heatstrip patio heater hanging by its cord. The mounts had corroded and tore off in a 42-knot gust.. 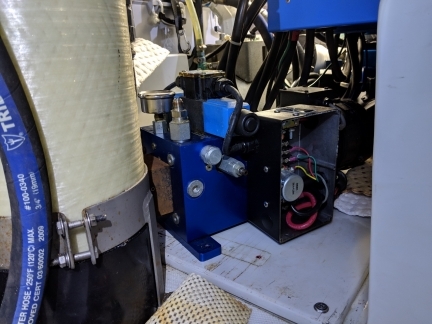 The heater and mounts have lasted incredibly well for the past five years, surviving a salt-water drenching during our 69.1° rollover and countless soakings during several north Atlantic gales, so we have no complaint there. The heater put a slight nick in our patio table as it came down, but otherwise no damage was done. It’s a good thing we went with a heavy-duty locking plug and socket, otherwise the damage done by the heavy heater would have been much worse. After installing the Heatstrip patio heater in Brisbane back in 2014, we bought two spares as we weren’t optimistic that the heaters would last more than two or three years in the corrosive saltwater environment. 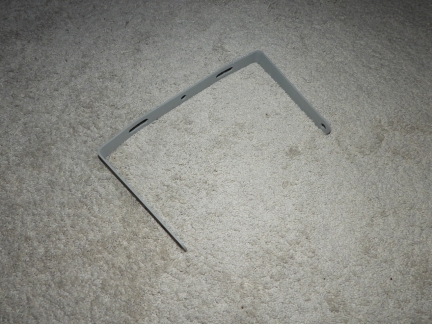 But the Heatstrip apparently is built like a tank and today is the first failure we’ve seen. Here James is transferring the socket from the old heater to the new. We replaced the patio heater today once the winds settled down for a bit. 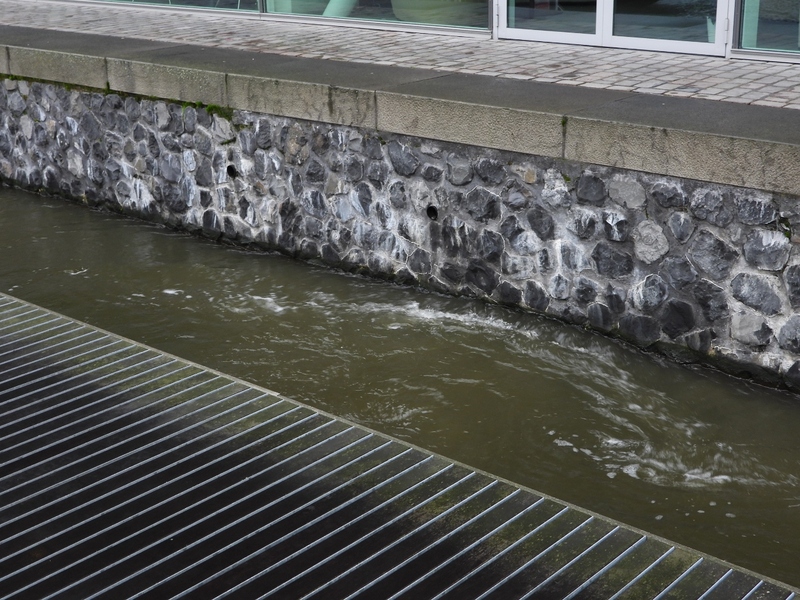 The failure was caused by a corroded bracket and heavy winds. The wing engine is due for an oil change every 12 months or 150 hours. Tt’s been a light-usage year on the wing engine, with only 68 hours. Our last oil change was in London a year ago. The watermaker filters are due for their annual change. 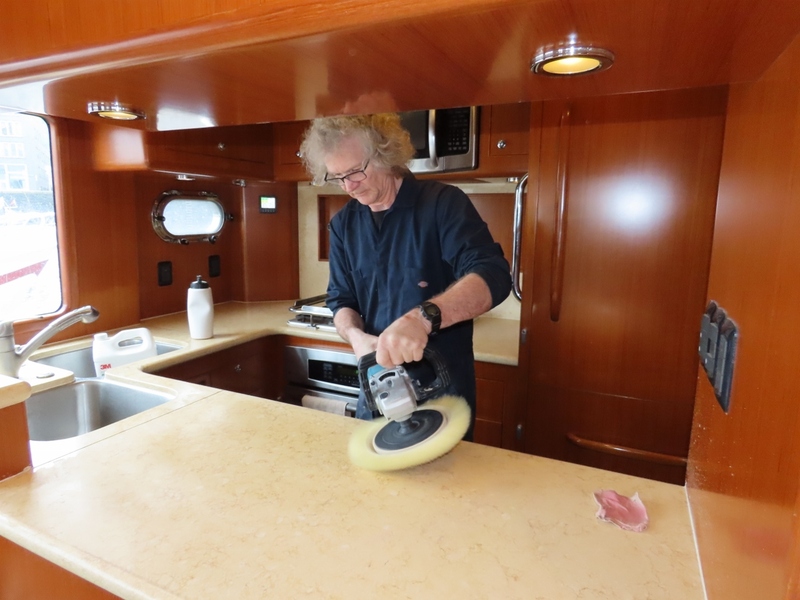 We have marble counters in the galley and both heads. We have several water marks and the counters are dulling with time. We gave Bulletproof Sealer a try but generally it didn’t seem to make a difference. The overall counters weren’t shinier and the water marks were still there. Back to the drawing board on that one. Since the stone sealer wasn’t effective, we decided to take an unusual approach. 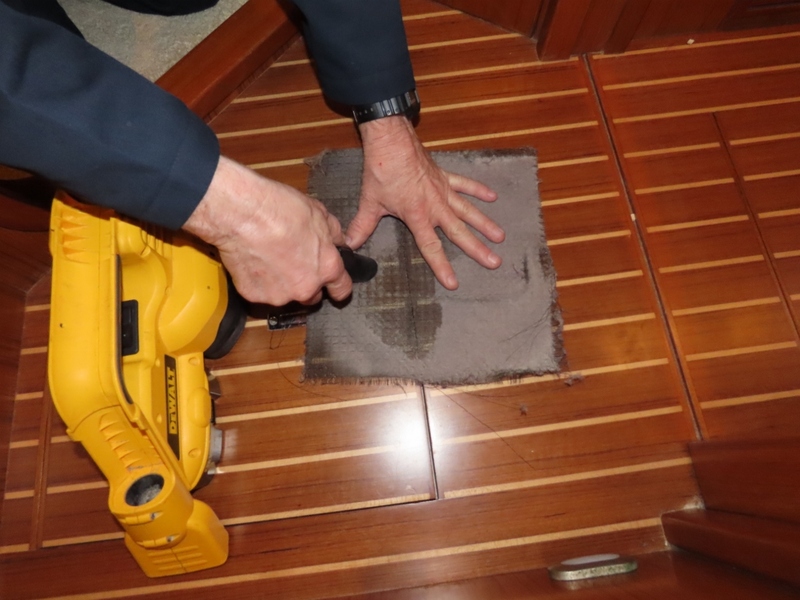 Our logic is that, over time, lots of microscrath dull the surface of the counter and this is similar to what happens to the outside of a fiberglass boat. We decided to try waxing the counter using 3M One-Step Restorer and Wax. This removed the marks and brought back a nice shine—the counters look better than they have in years. And, now that they are waxed they are much less sensitive to liquids and are much more resistant to marking. This looks like a real win and it’s a quick and easy operation. We have rope lighting installed behind the teak window valances in the salon. 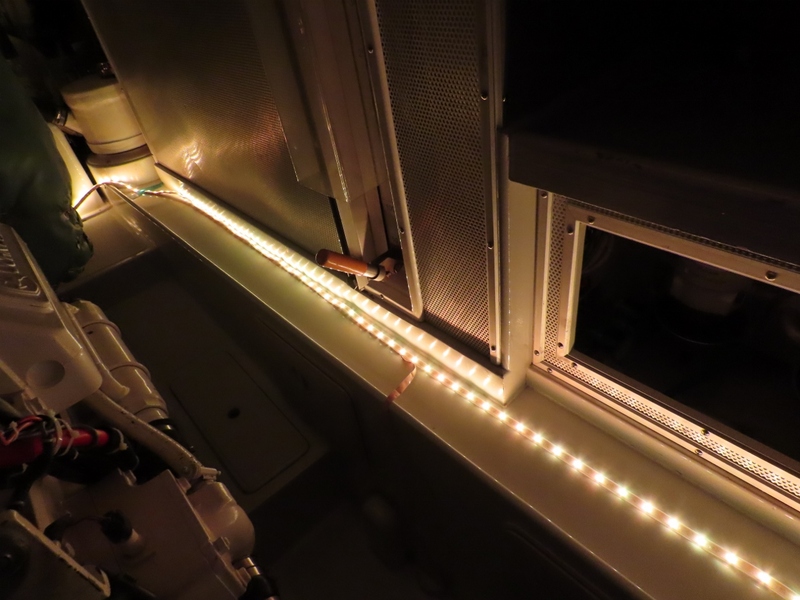 The lighting had become too dim over time, so we’re considering replacing it with the LED light strips that we use on the boat exterior. Here we are testing for brightness and color in the dark engine room. It’s no wonder the rope lighting was getting dim—it appears to be failing with dark brown overheated sections every six inches along its length. It’s definitely time that one came down. 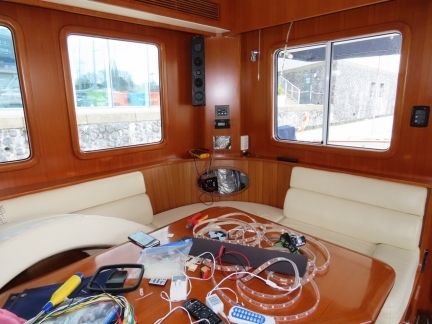 We know the rope light string runs on 24VDC, but we haven’t chased down the source yet. 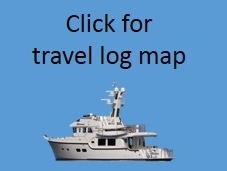 Click the travel log icon on the left to see these locations on a map, with the complete log of our cruise. 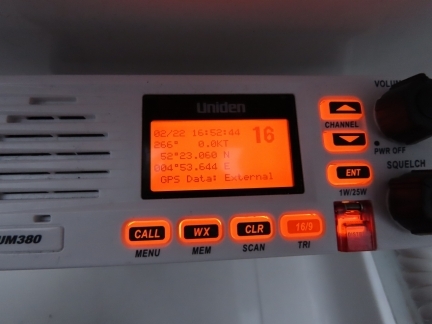 On the map page, clicking on a camera or text icon will display a picture and/or log entry for that location, and clicking on the smaller icons along the route will display latitude, longitude and other navigation data for that location. And a live map of our current route and most recent log entries always is available at mvdirona.com/maps. If your comment doesn't show up right away, send us email and we'll dredge it out of the spam filter.